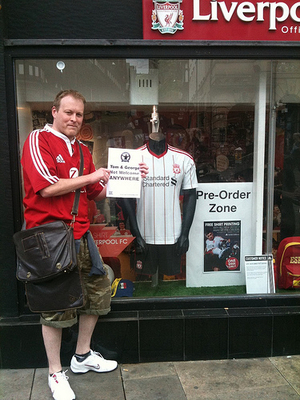 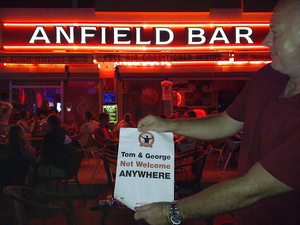 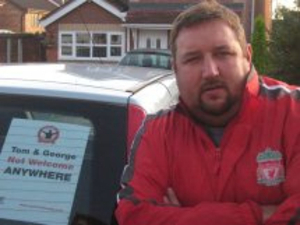 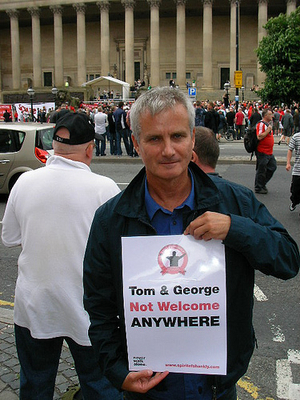 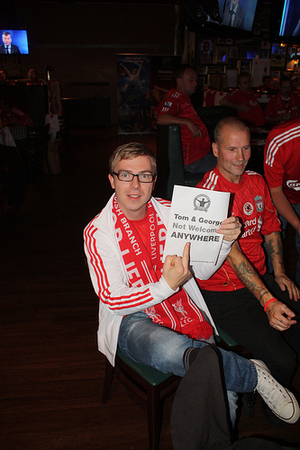 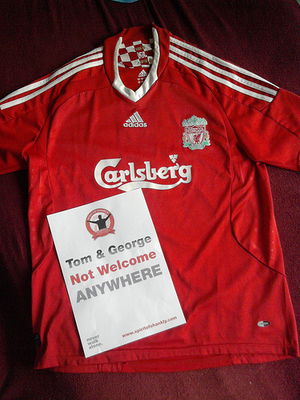 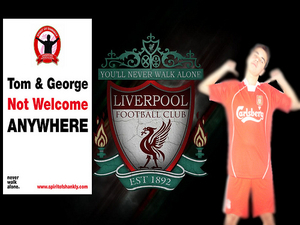 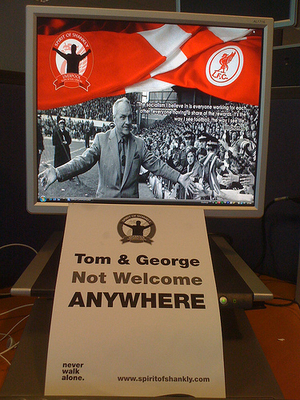 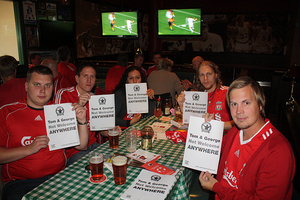 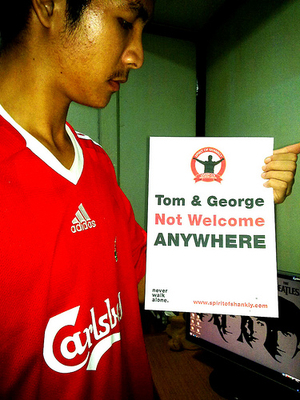 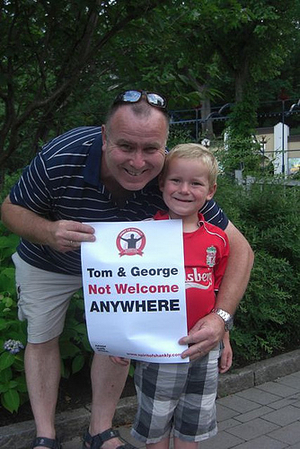 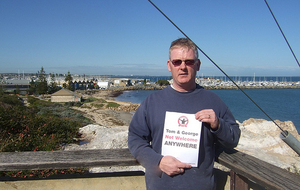 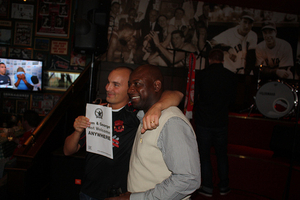 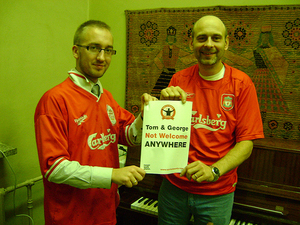 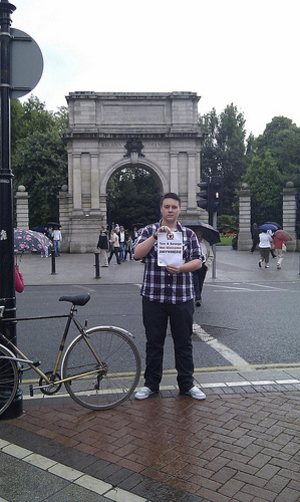 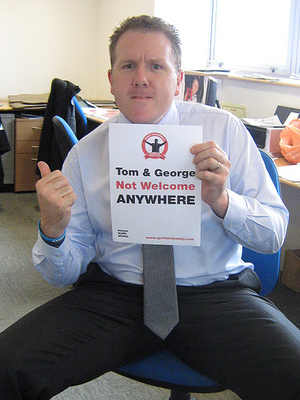 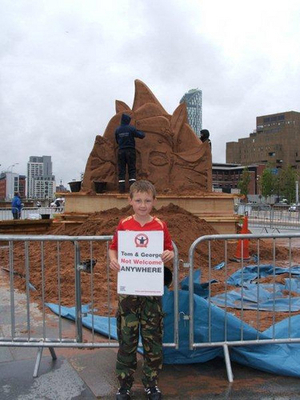 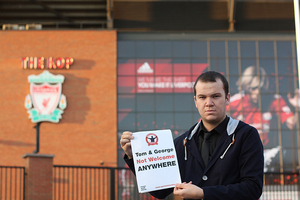 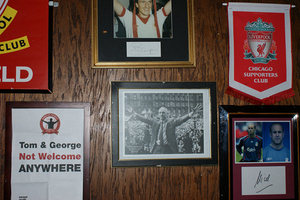 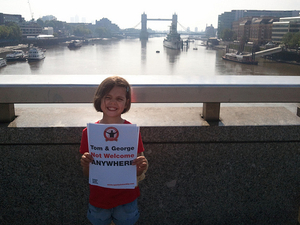 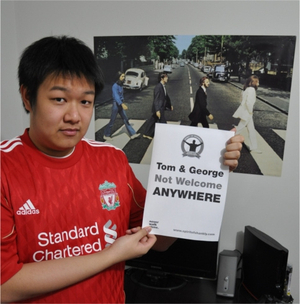 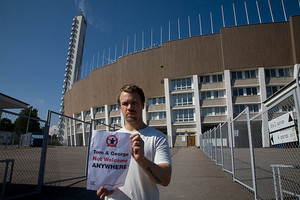 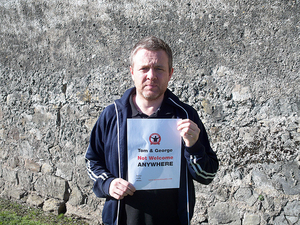 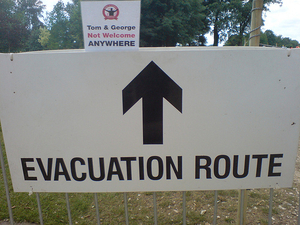 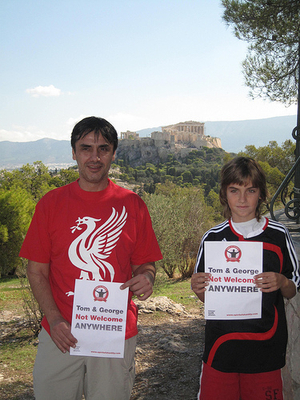 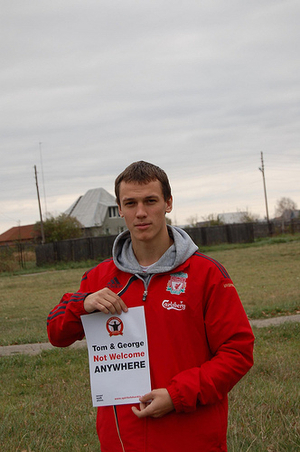 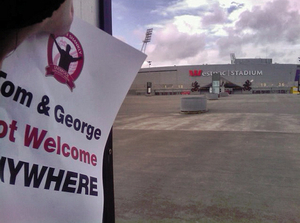 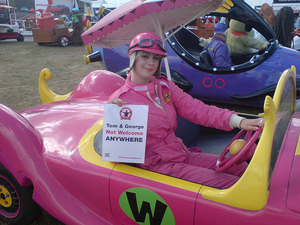 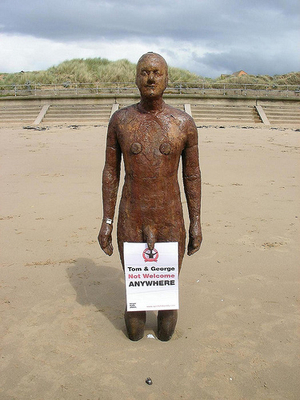 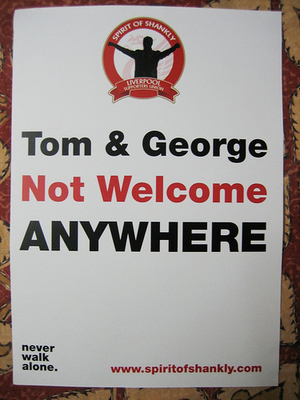 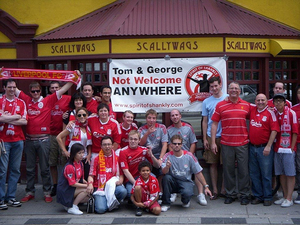 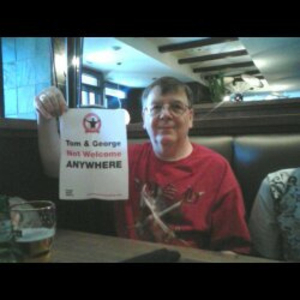 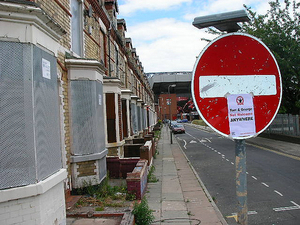 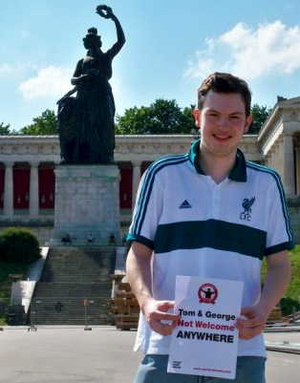 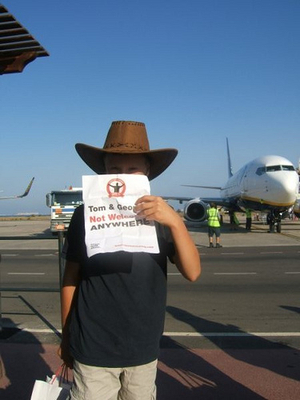 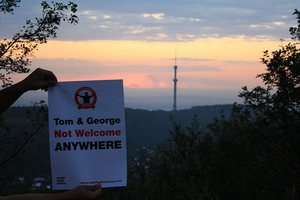 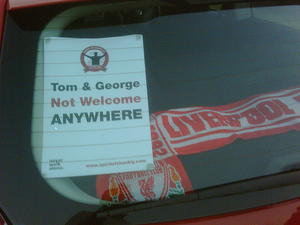 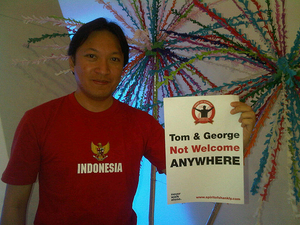 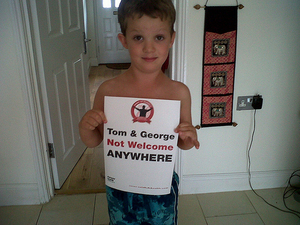 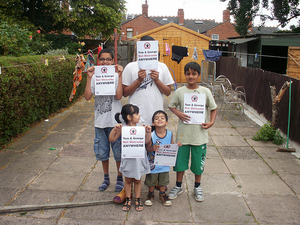 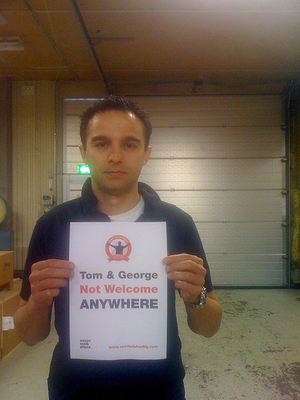 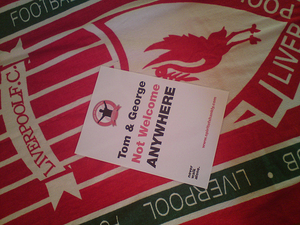 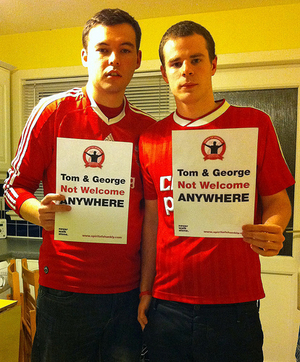 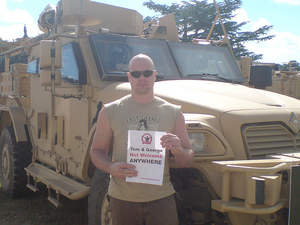 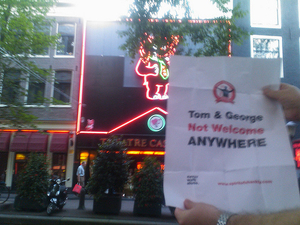 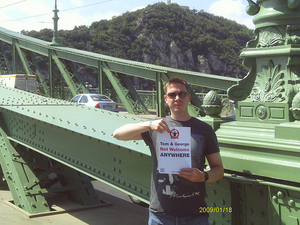 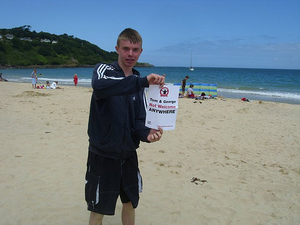 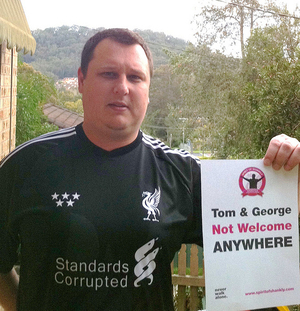 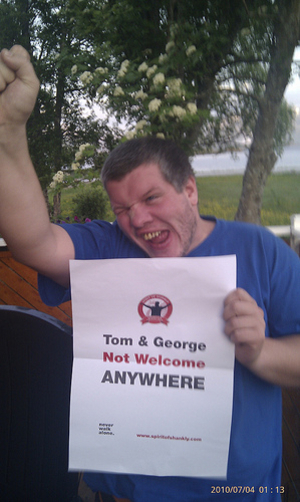 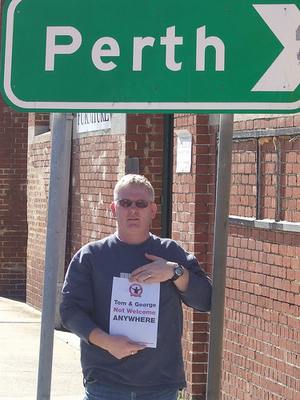 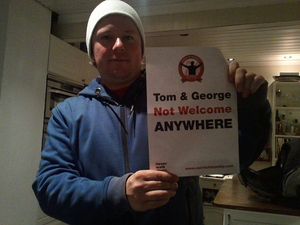 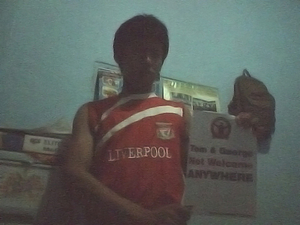 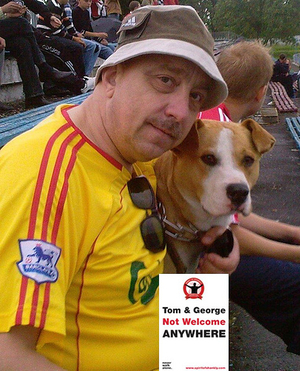 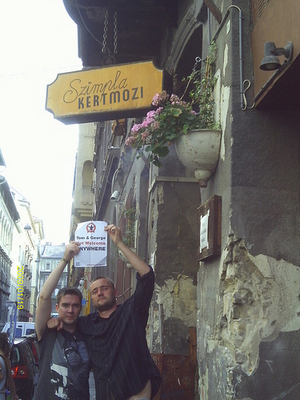 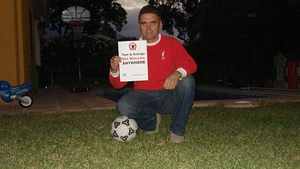 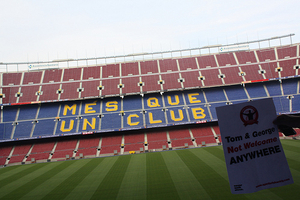 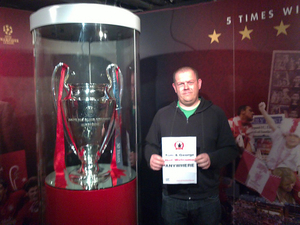 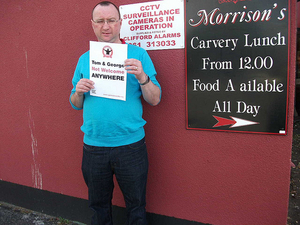 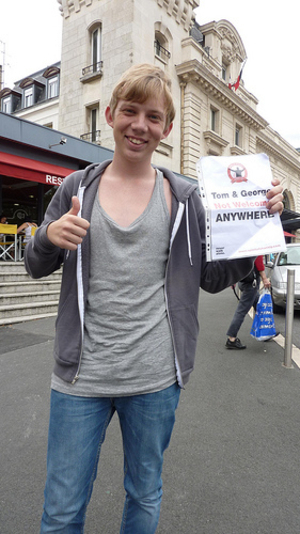 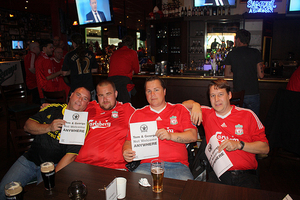 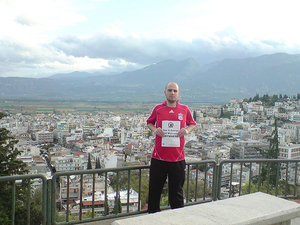 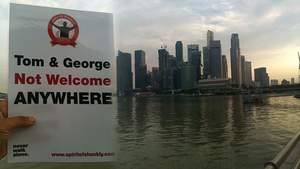 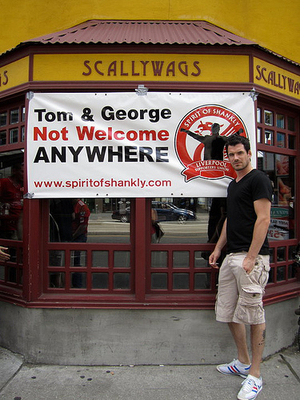 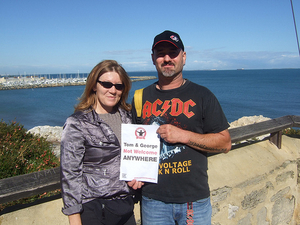 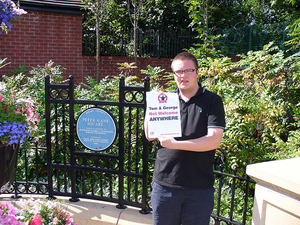 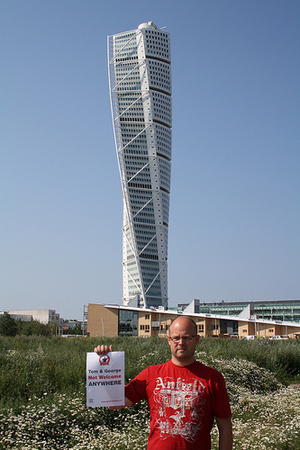 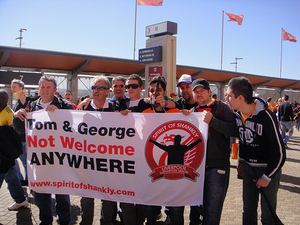 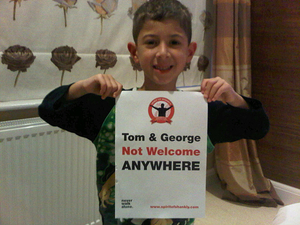 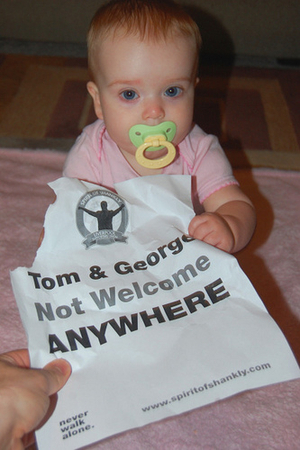 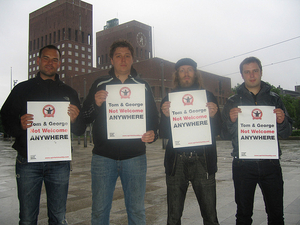 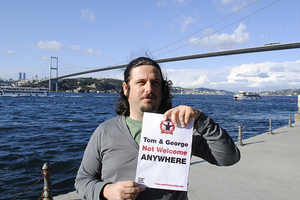 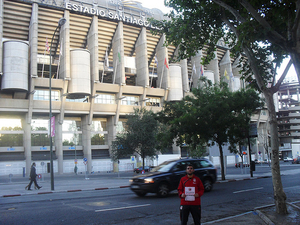 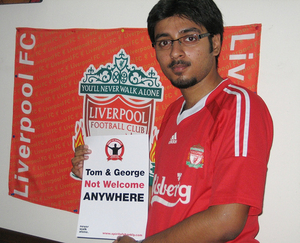 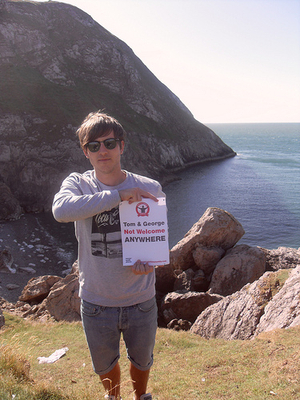 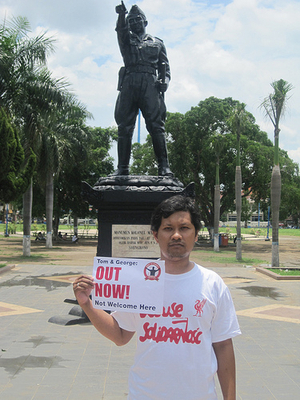 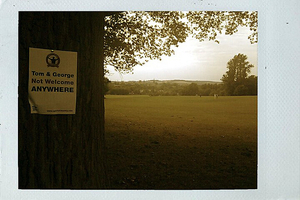 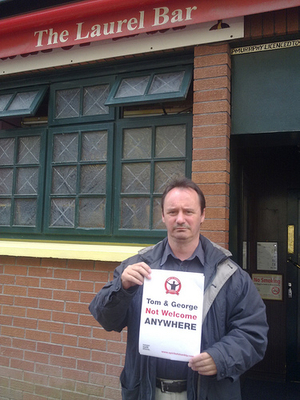 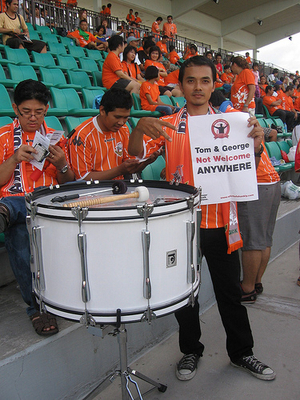 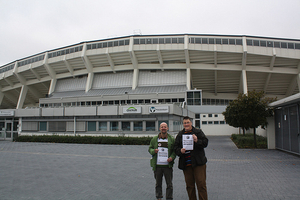 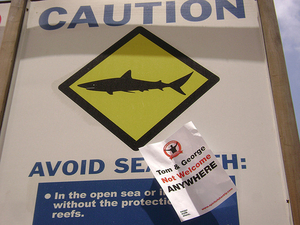 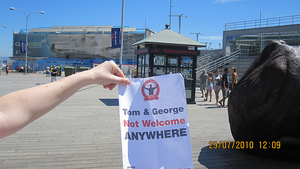 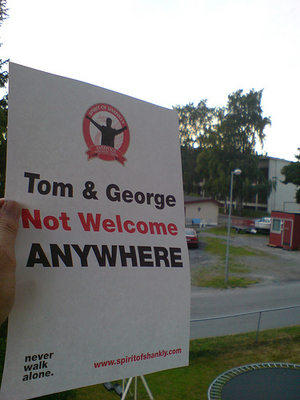 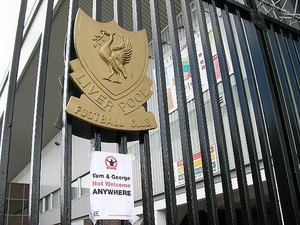 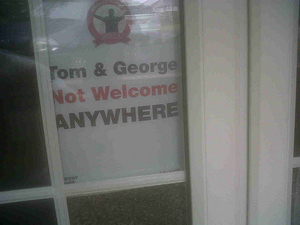 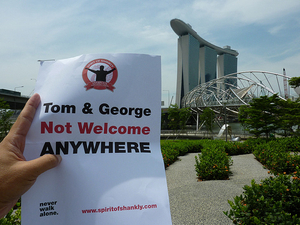 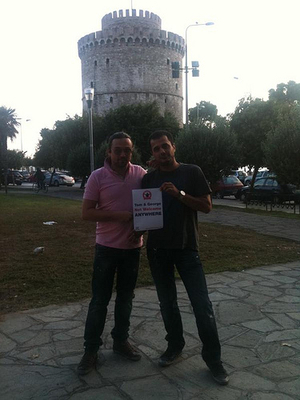 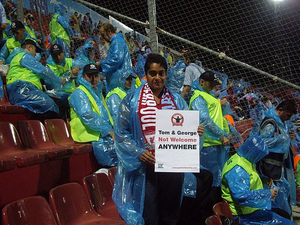 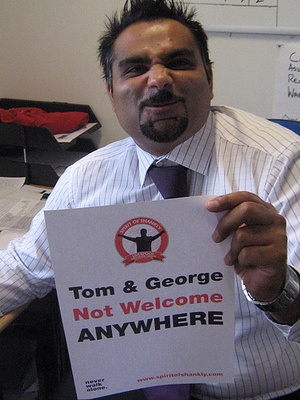 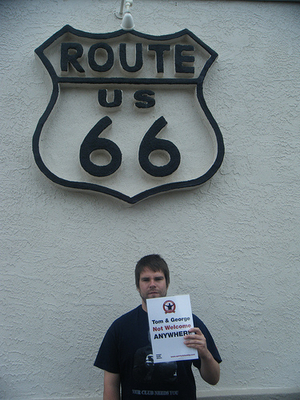 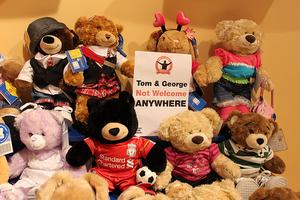 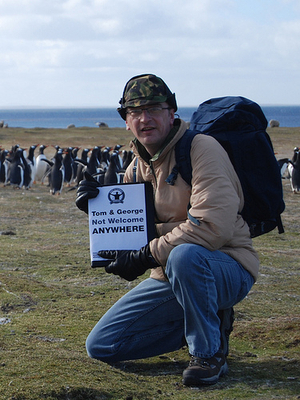 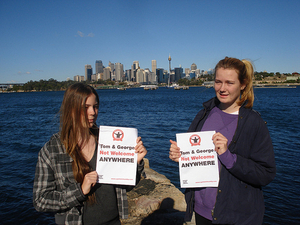 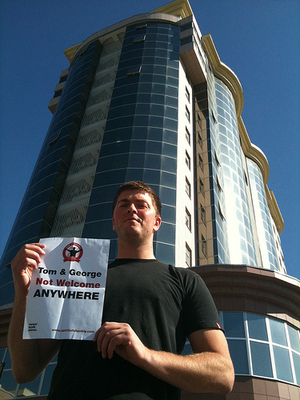 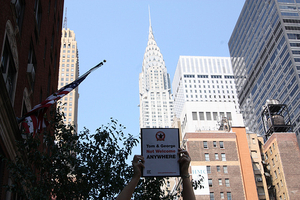 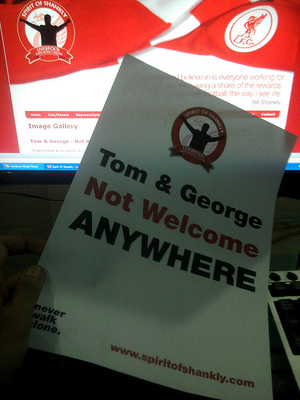 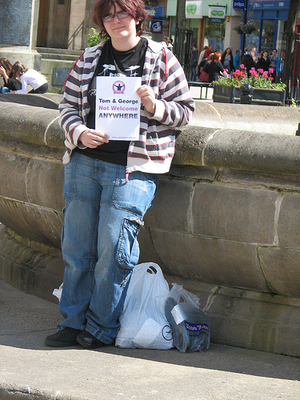 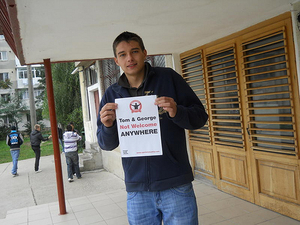 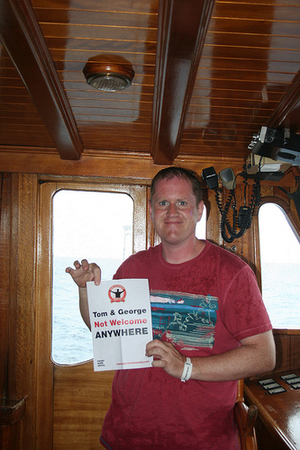 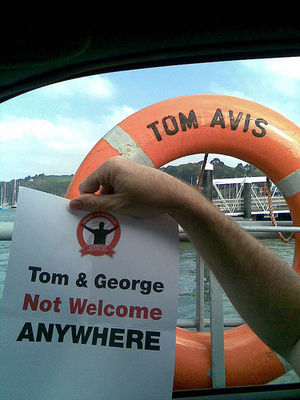 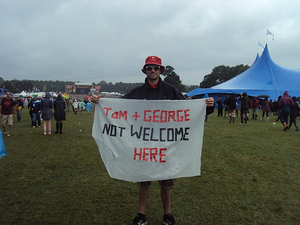 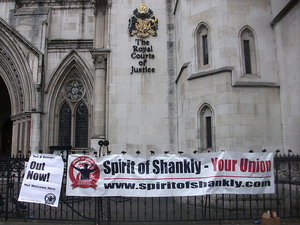 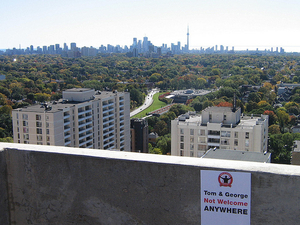 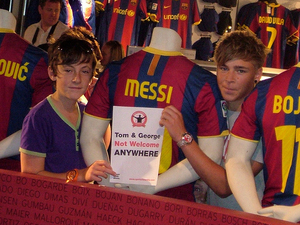 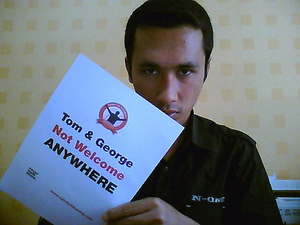 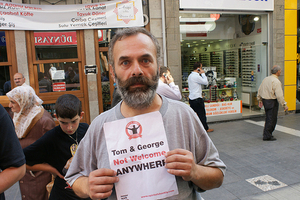 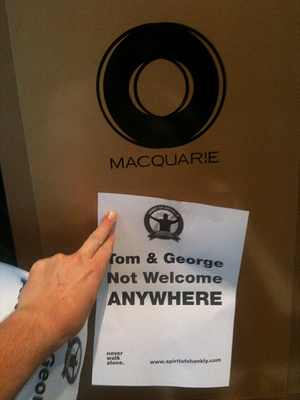 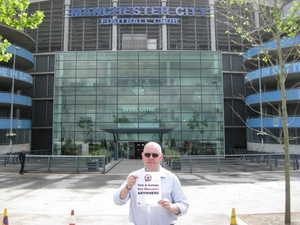 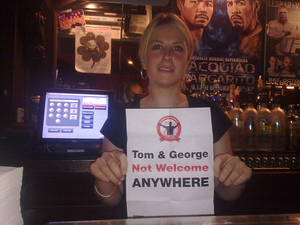 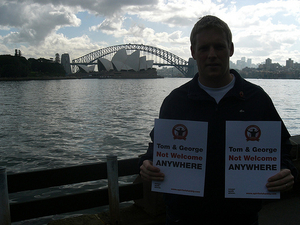 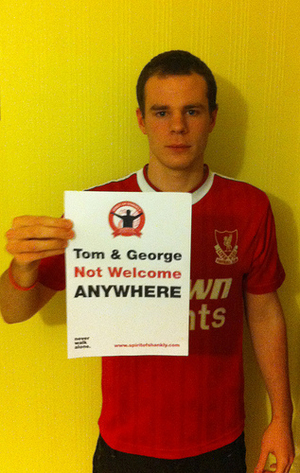 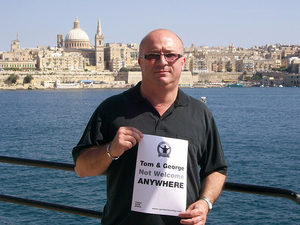 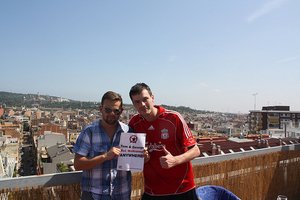 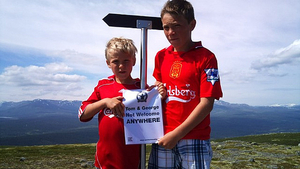 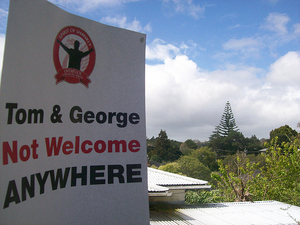 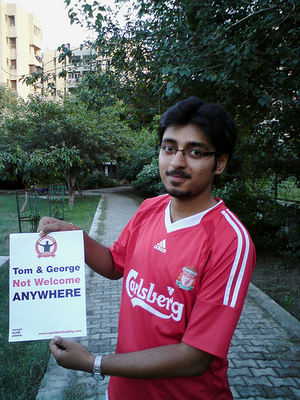 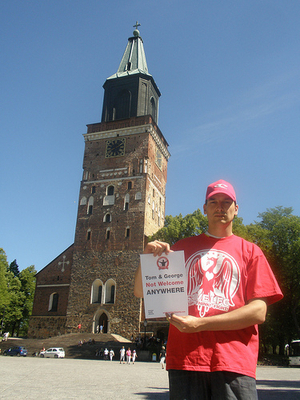 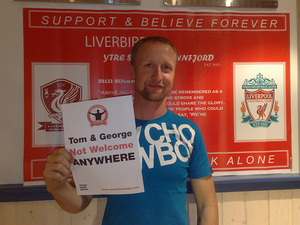 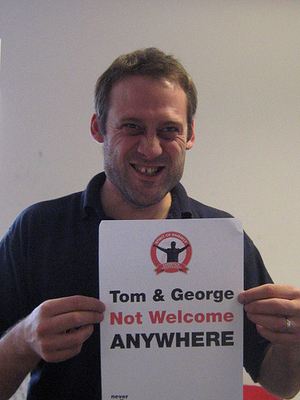 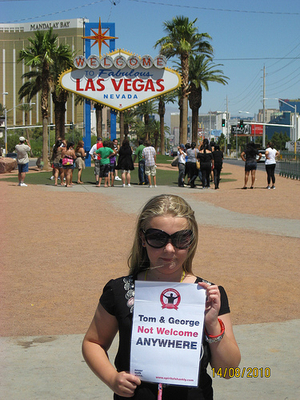 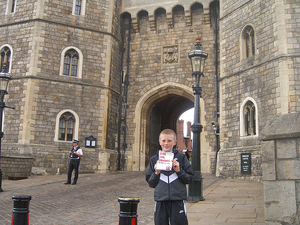 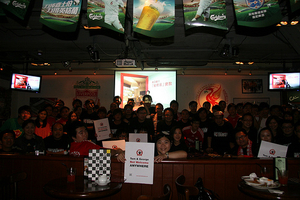 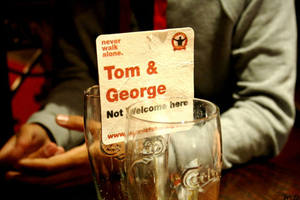 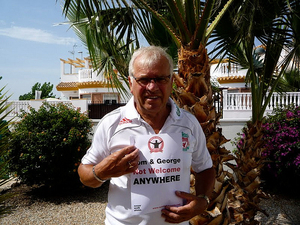 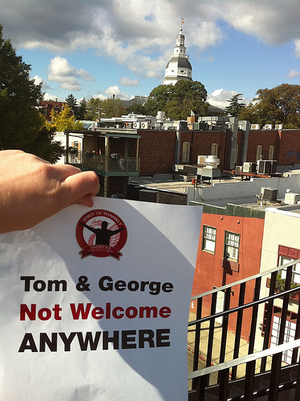 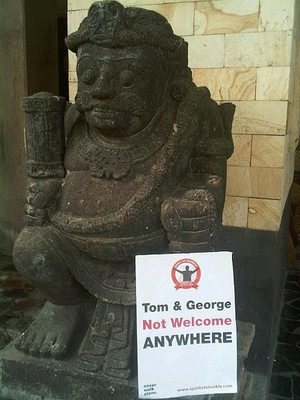 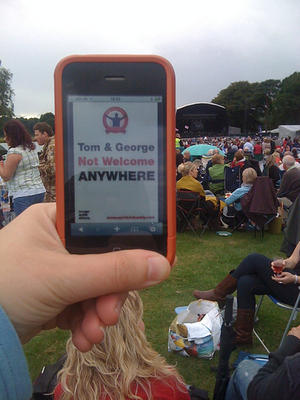 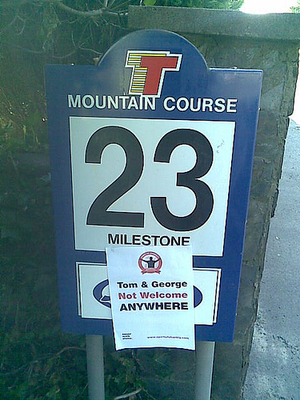 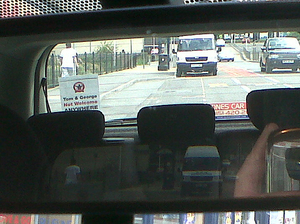 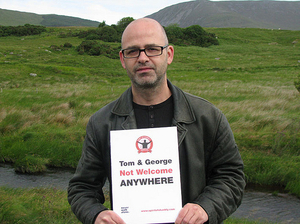 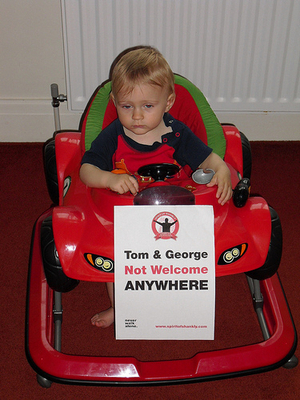 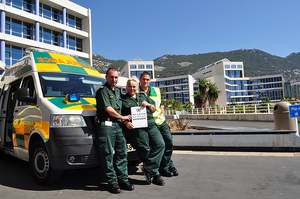 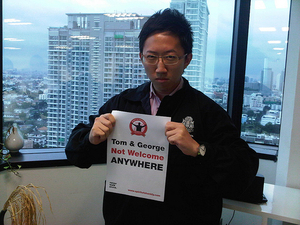 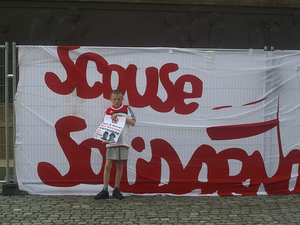 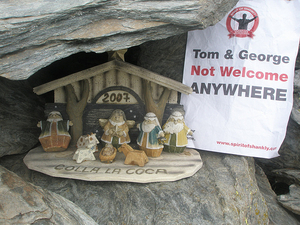 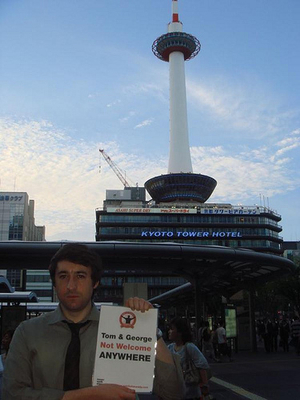 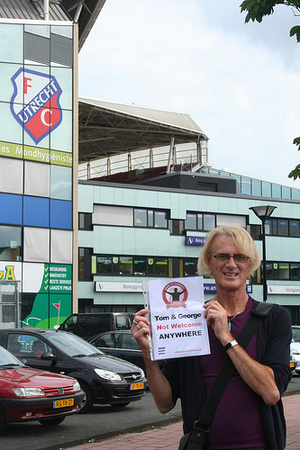 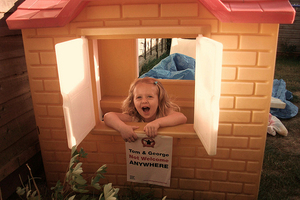 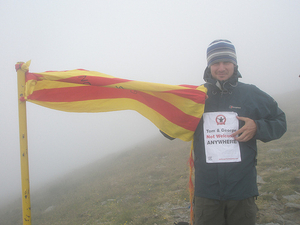 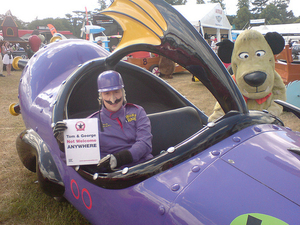 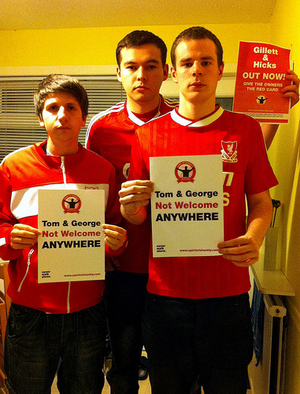 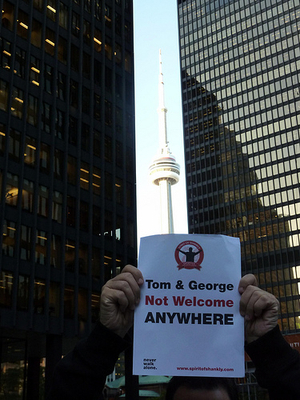 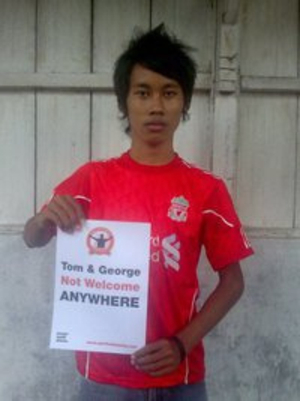 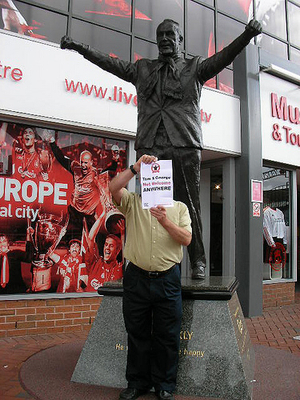 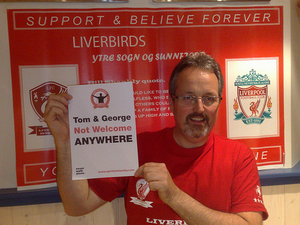 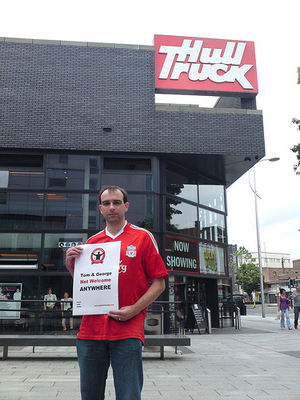 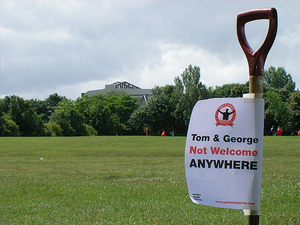 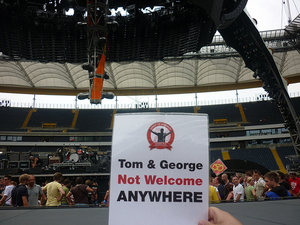 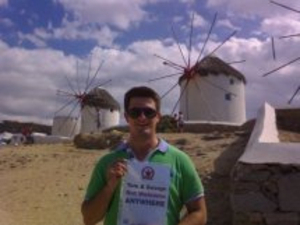 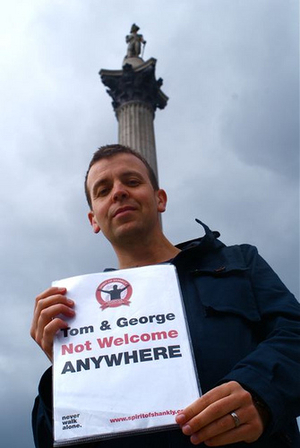 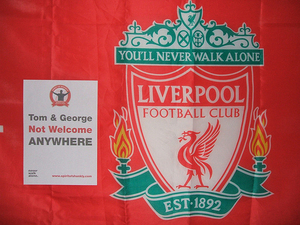 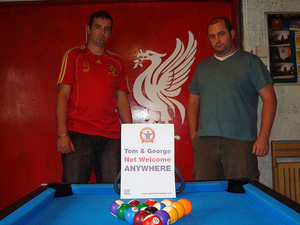 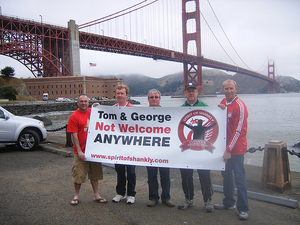 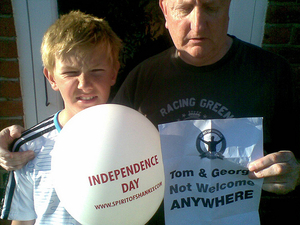 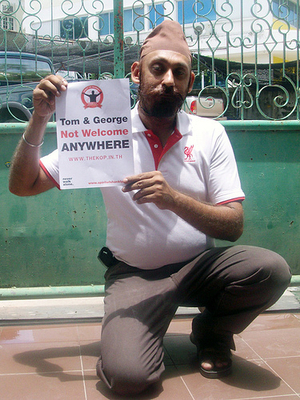 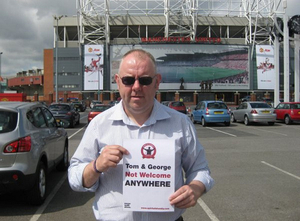 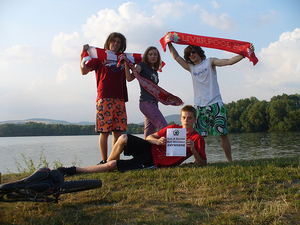 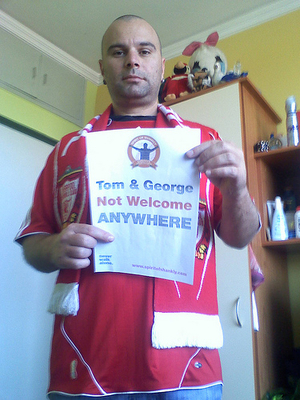 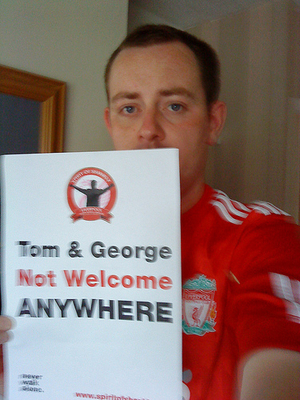 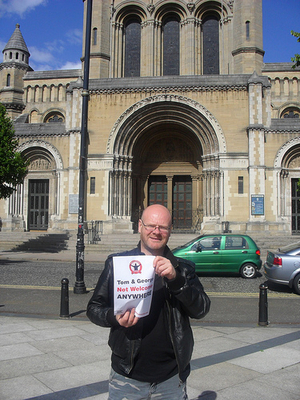 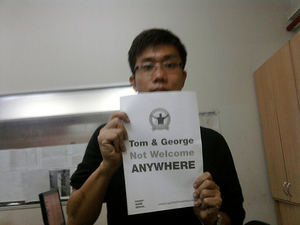 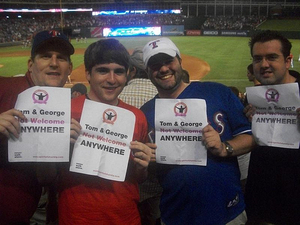 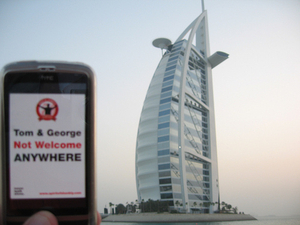 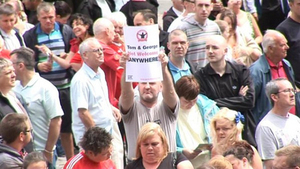 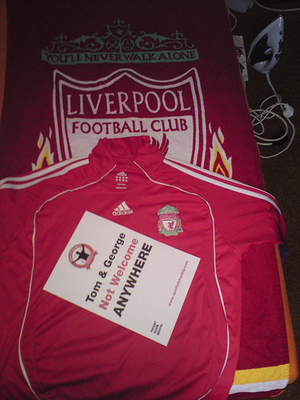 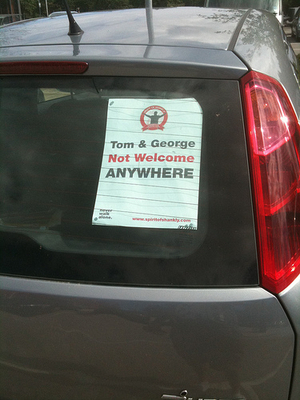 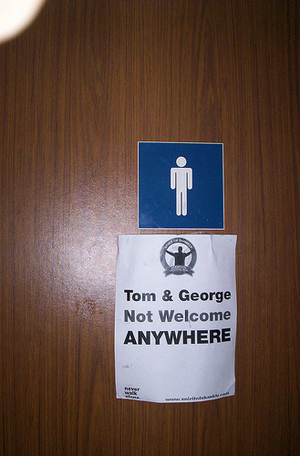 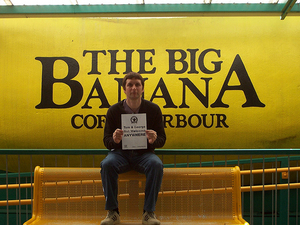 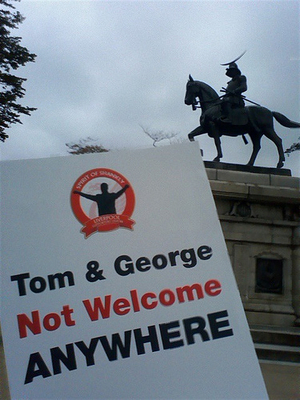 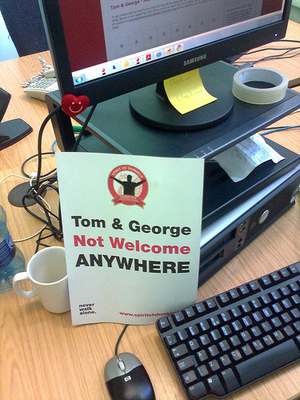 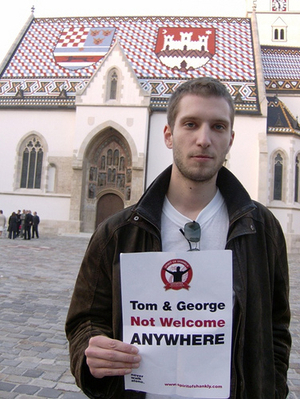 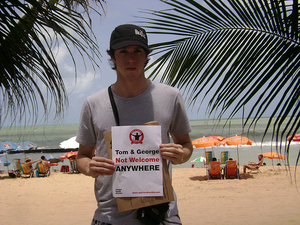 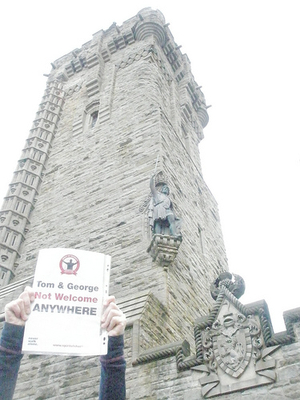 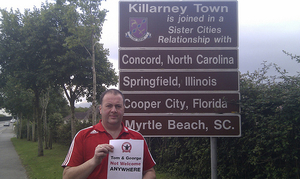 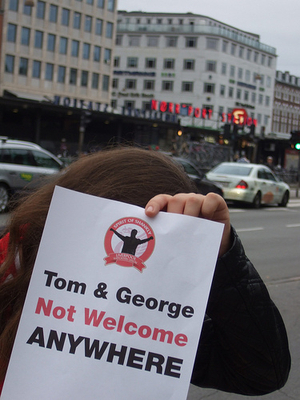 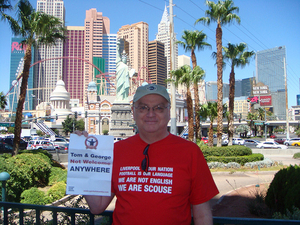 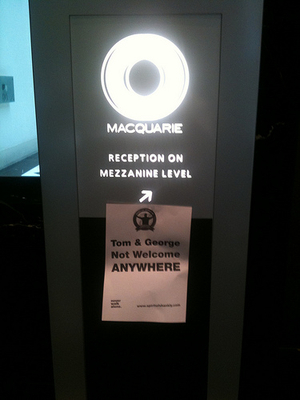 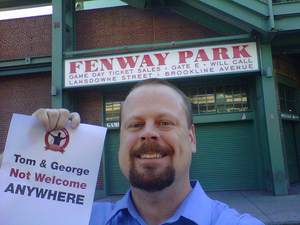 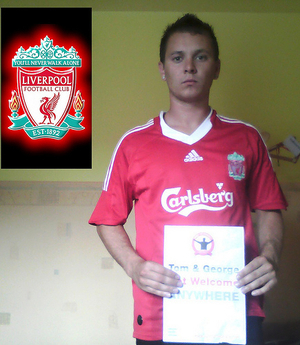 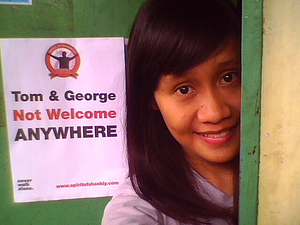 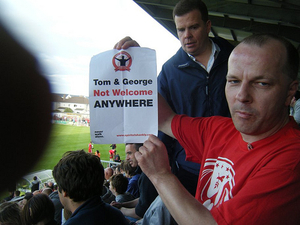 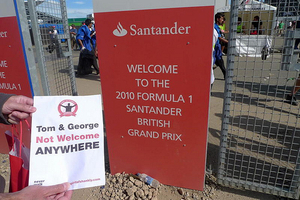 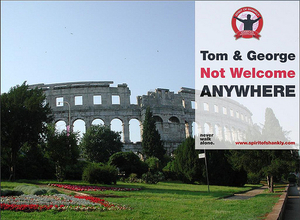 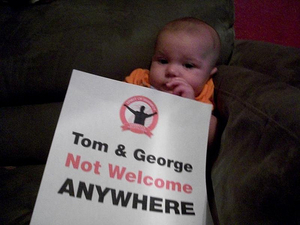 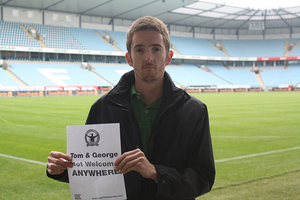 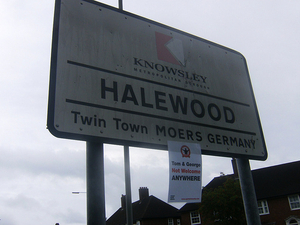 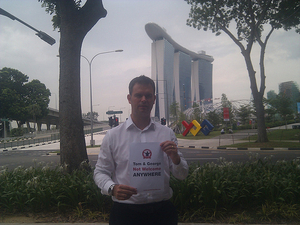 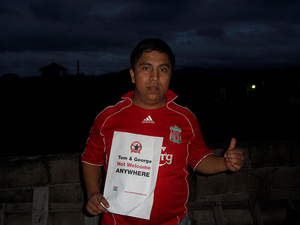 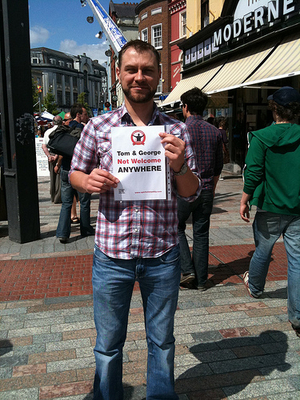 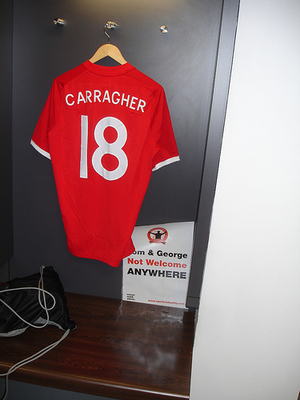 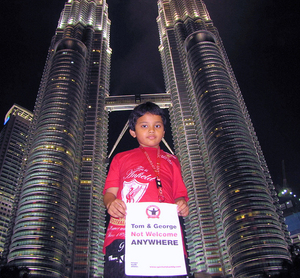 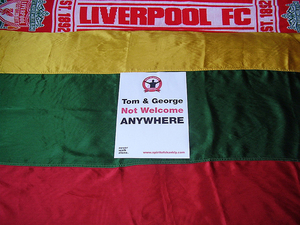 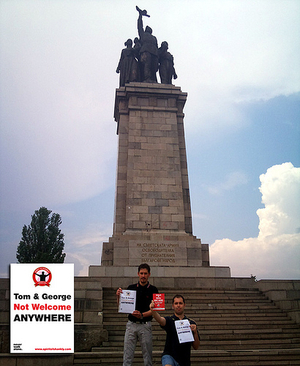 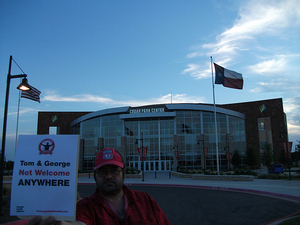 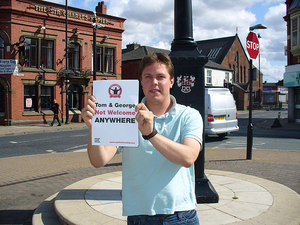 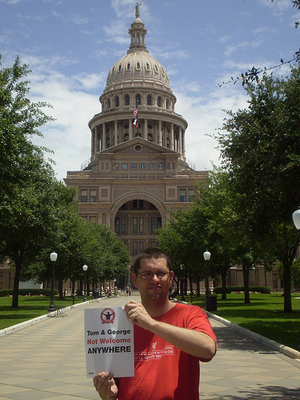 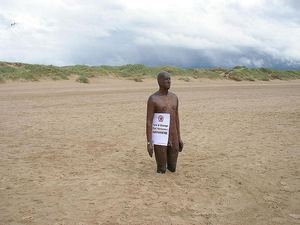 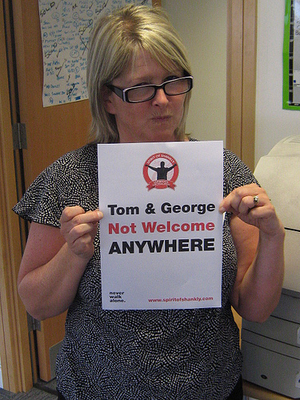 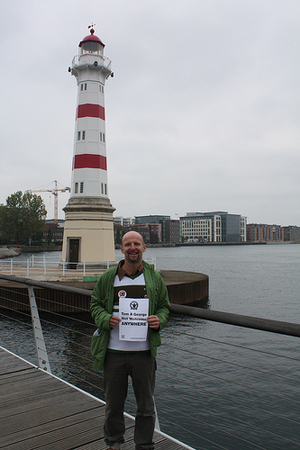 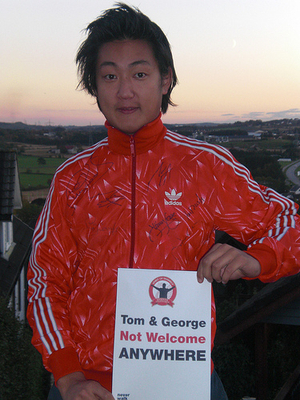 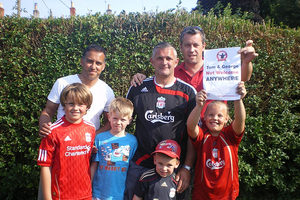 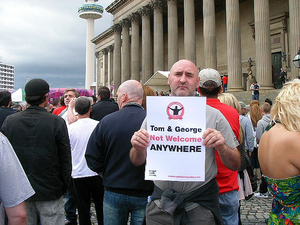 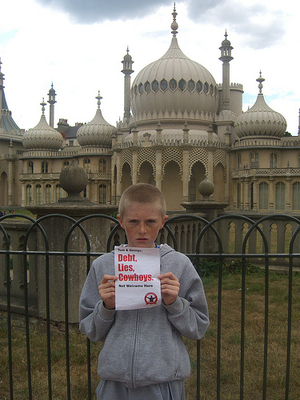 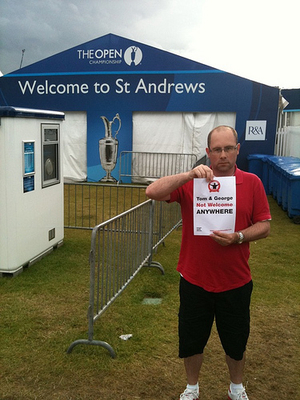 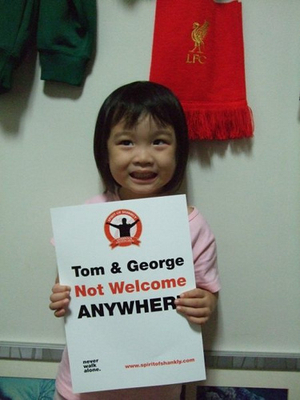 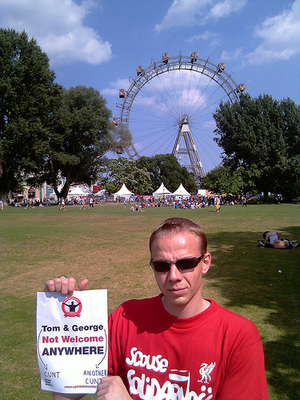 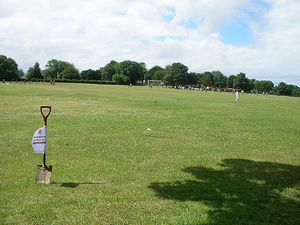 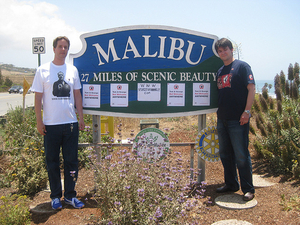 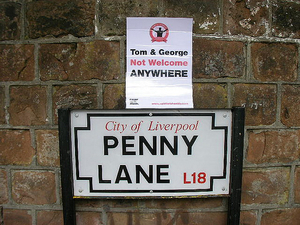 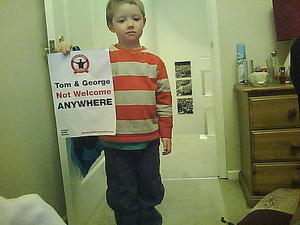 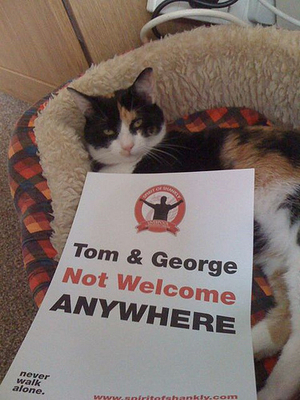 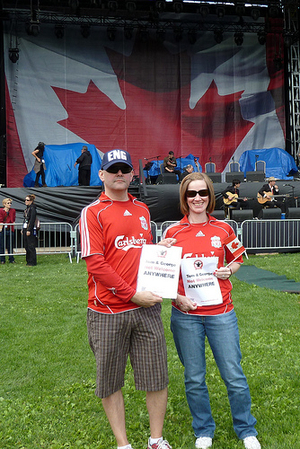 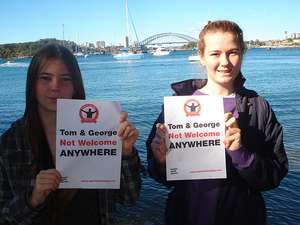 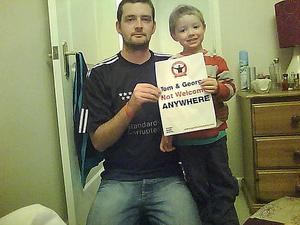 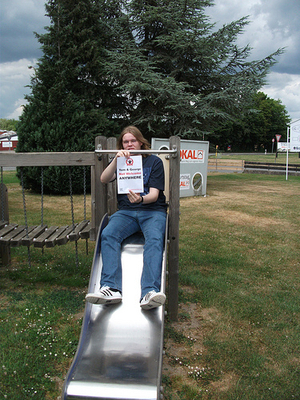 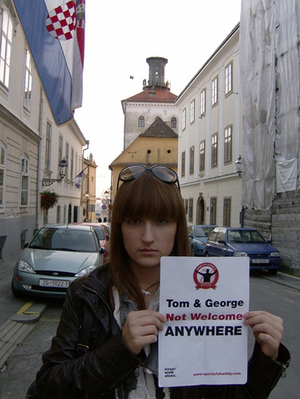 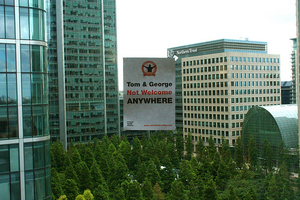 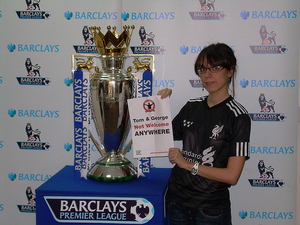 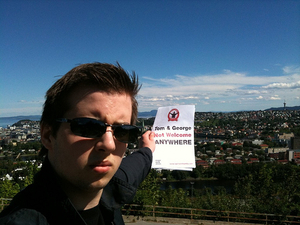 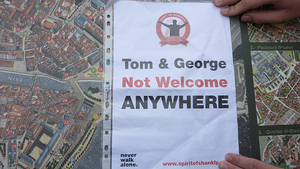 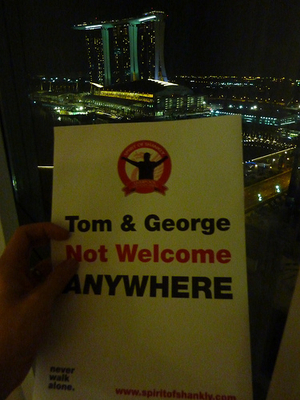 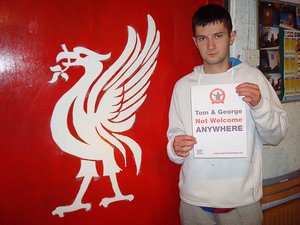 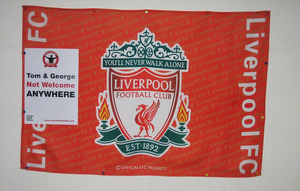 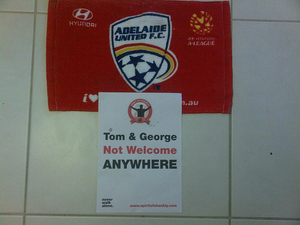 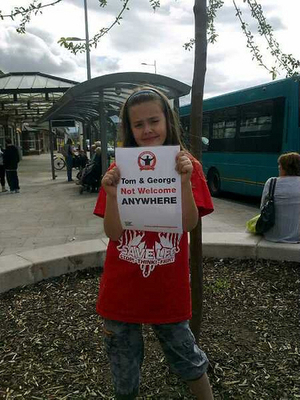 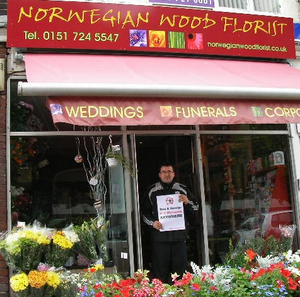 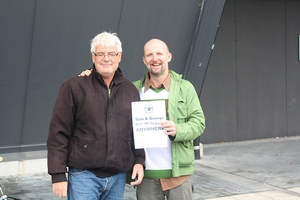 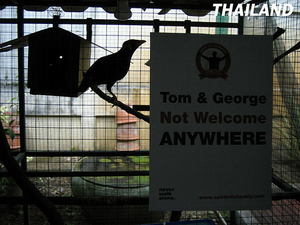 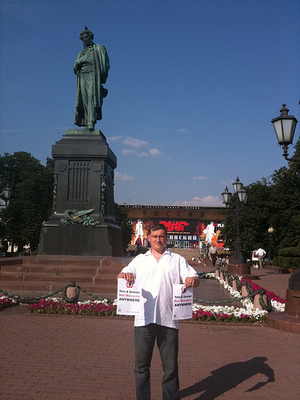 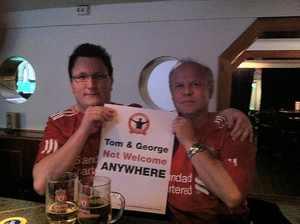 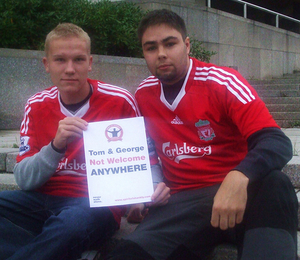 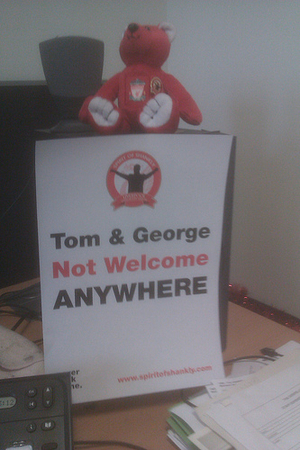 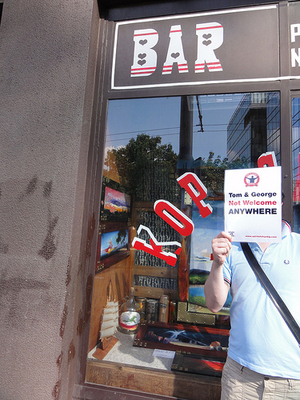 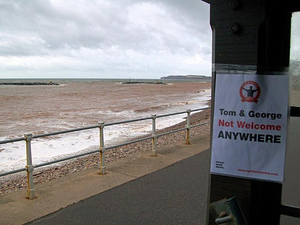 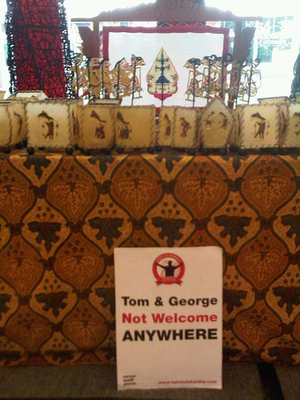 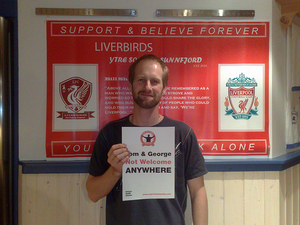 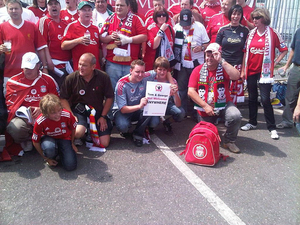 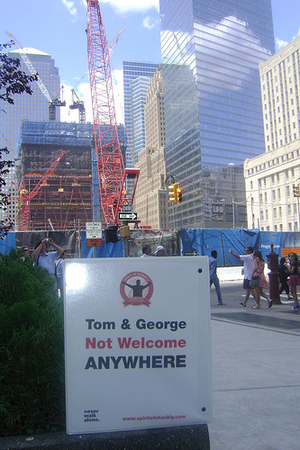 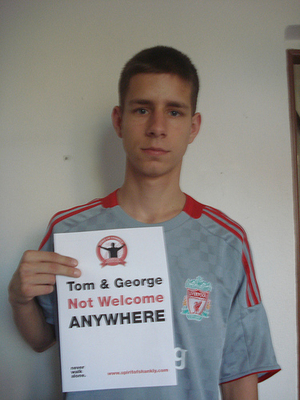 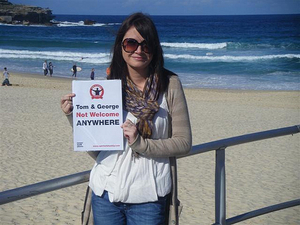 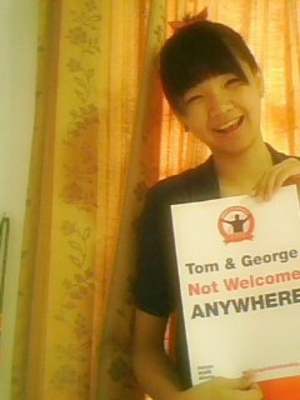 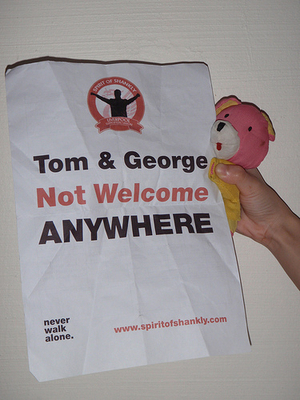 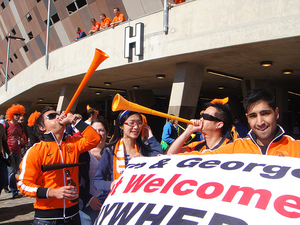 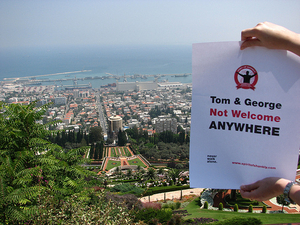 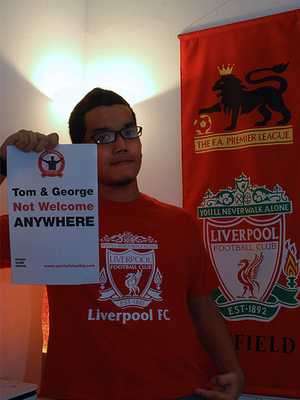 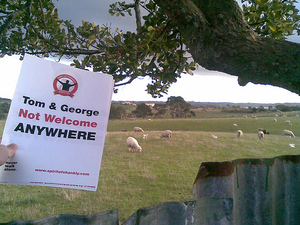 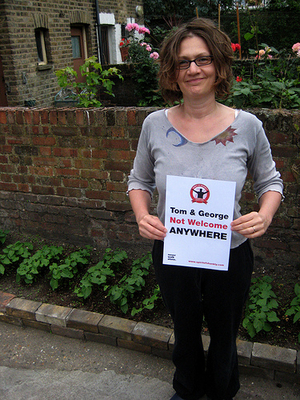 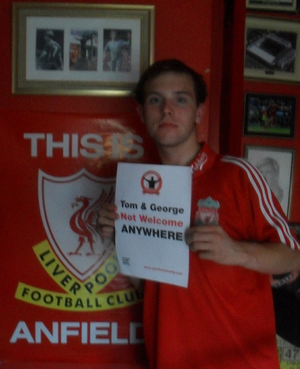 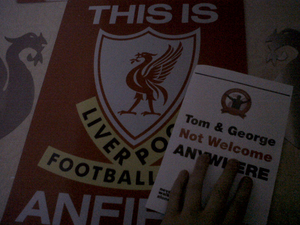 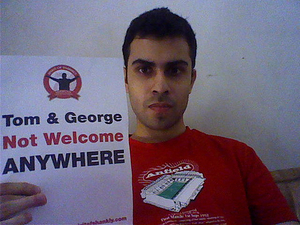 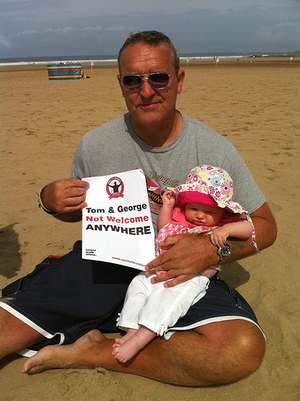 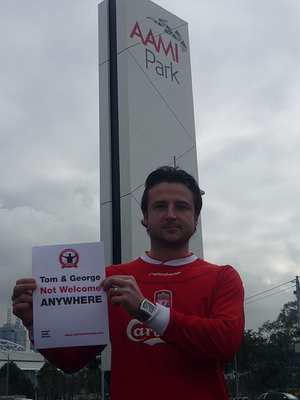 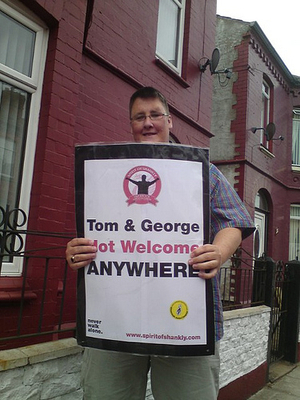 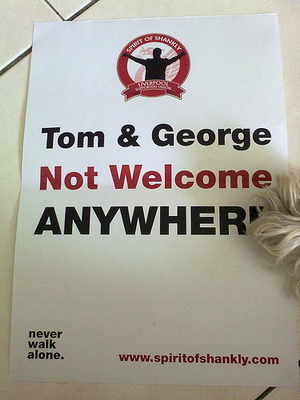 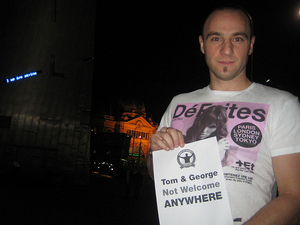 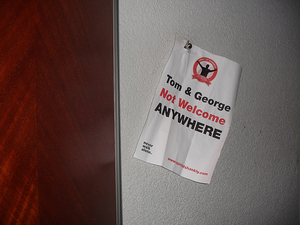 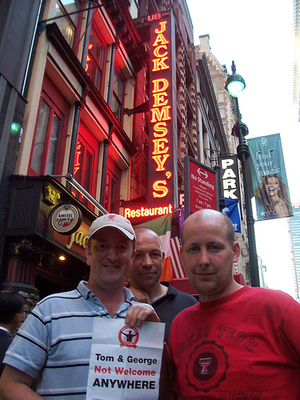 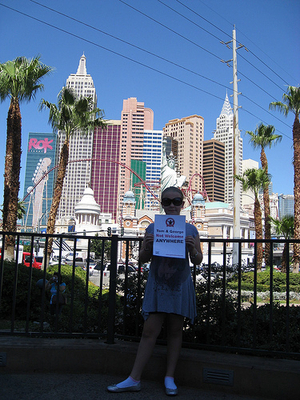 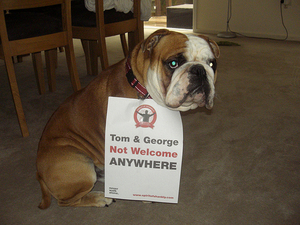 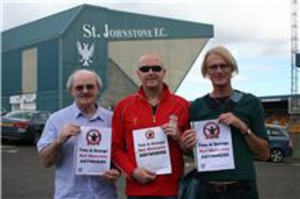 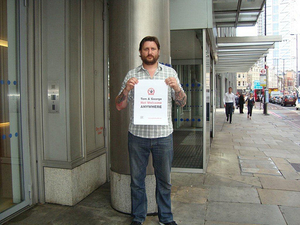 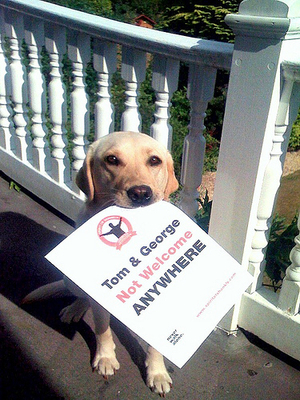 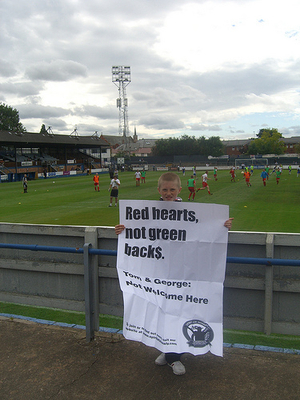 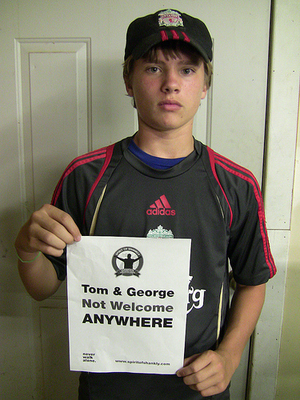 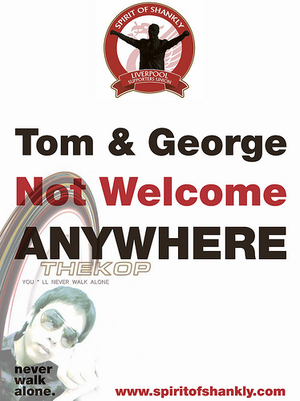 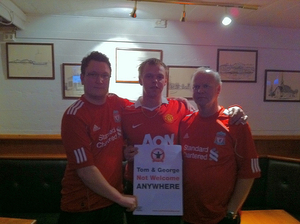 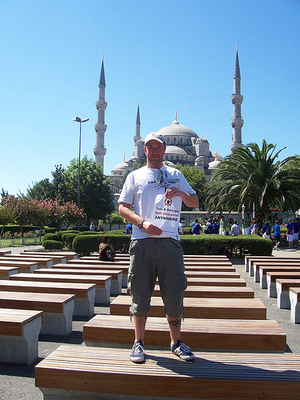 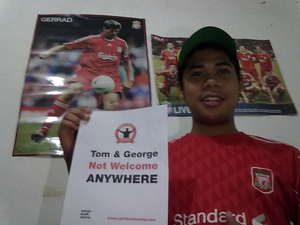 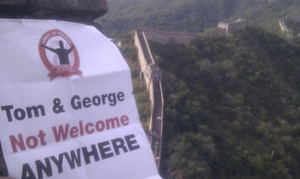 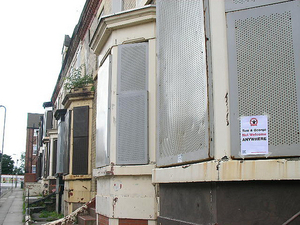 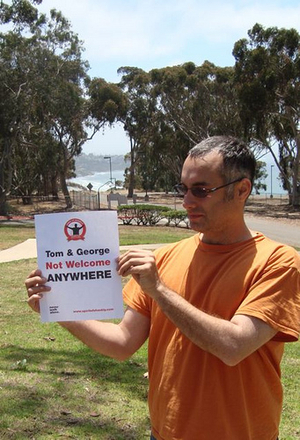 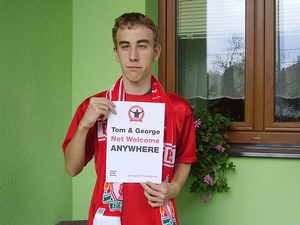 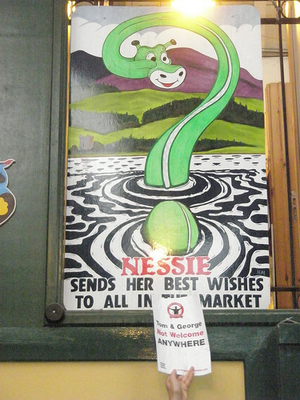 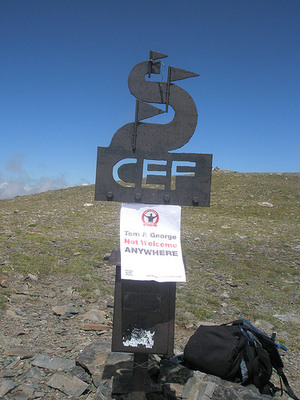 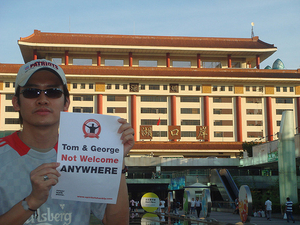 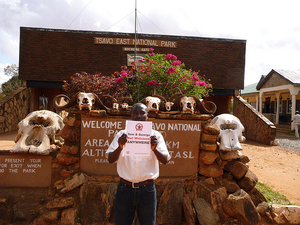 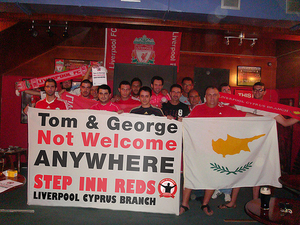 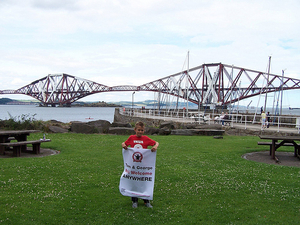 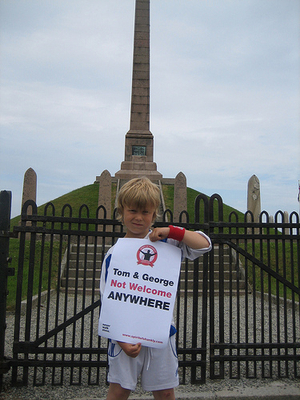 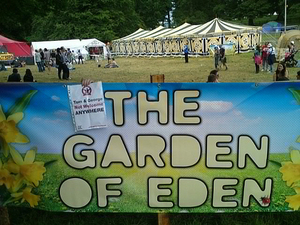 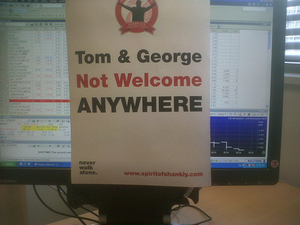 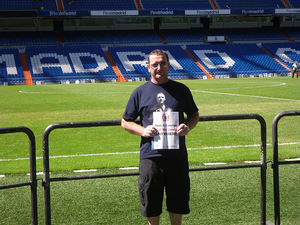 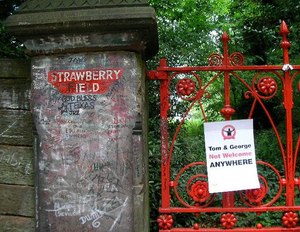 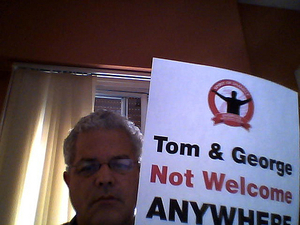 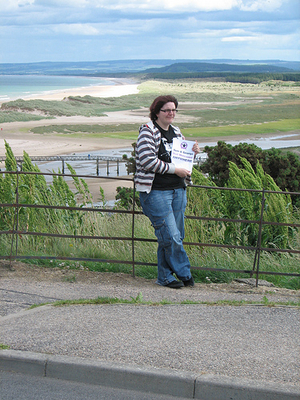 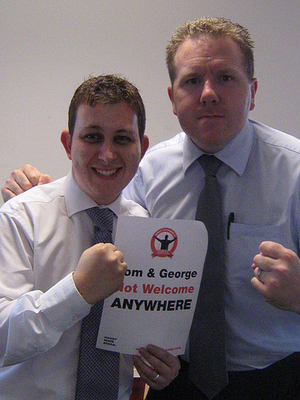 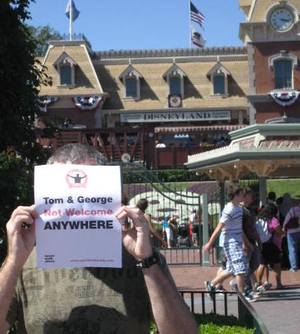 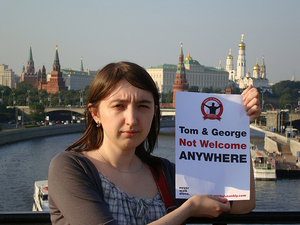 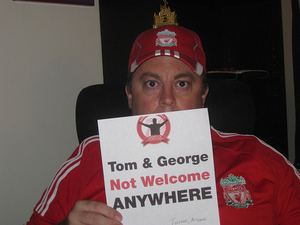 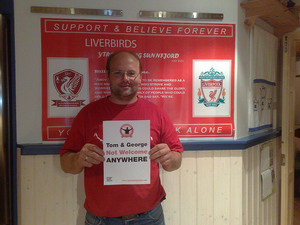 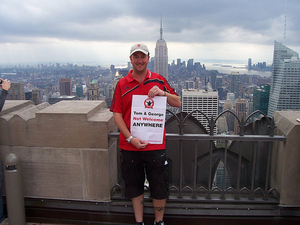 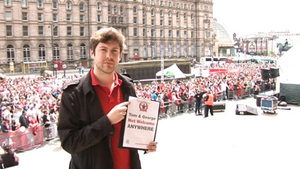 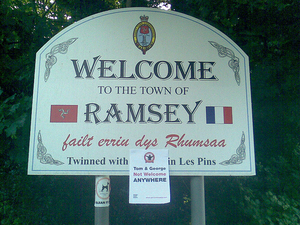 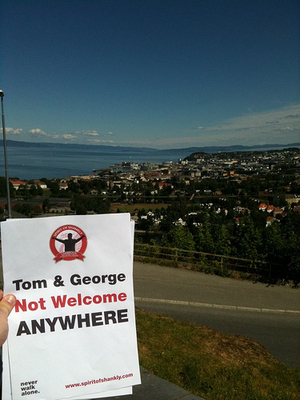 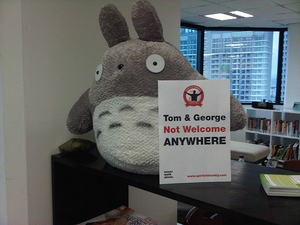 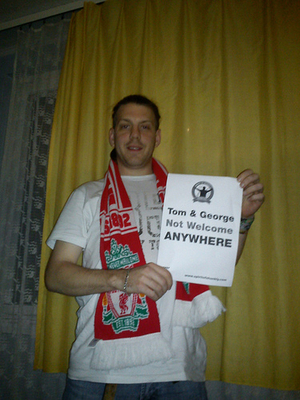 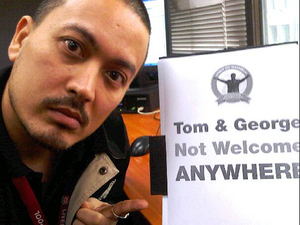 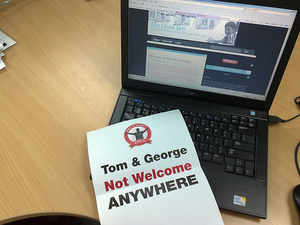 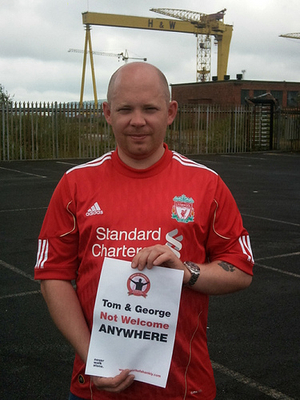 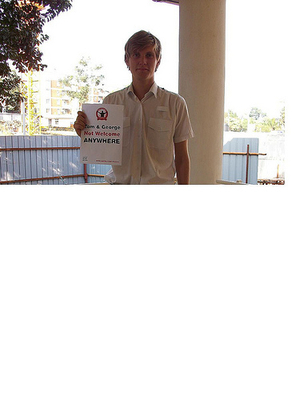 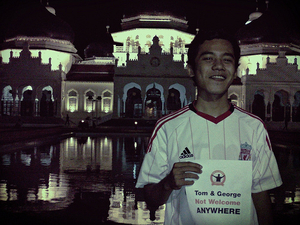 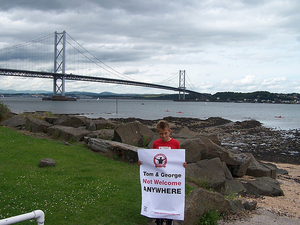 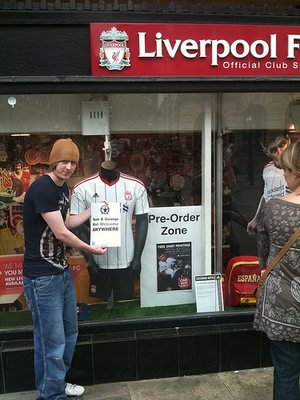 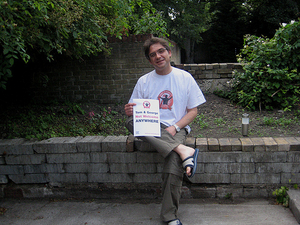 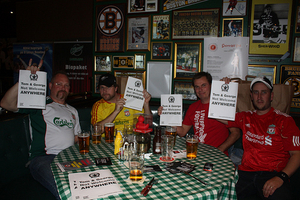 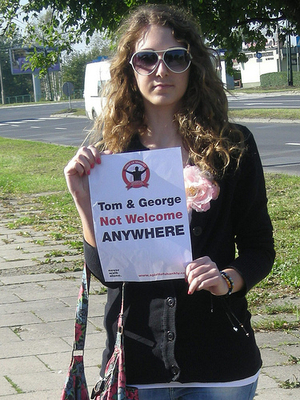 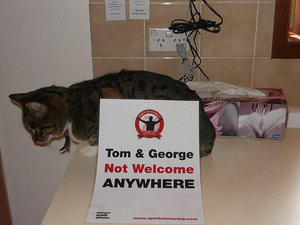 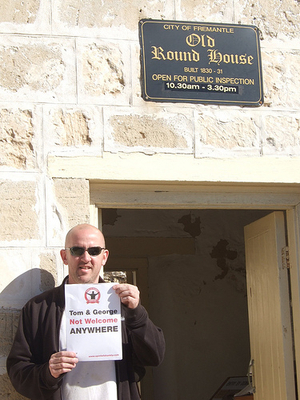 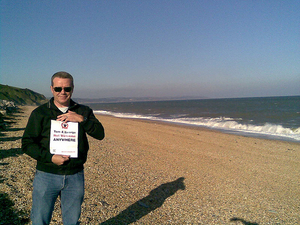 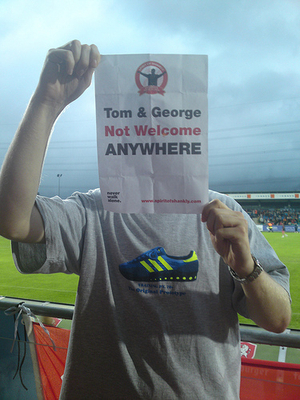 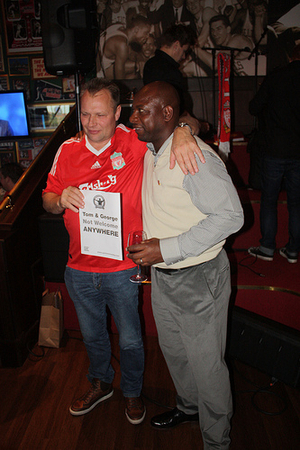 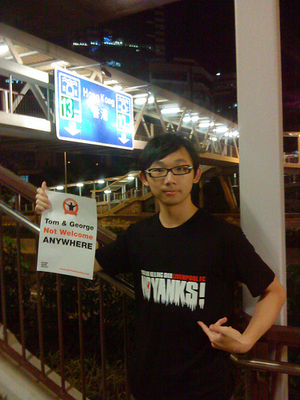 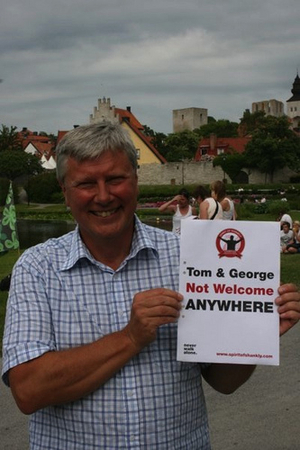 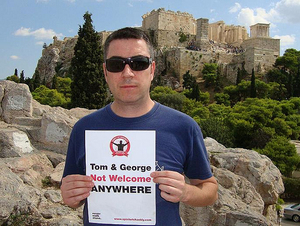 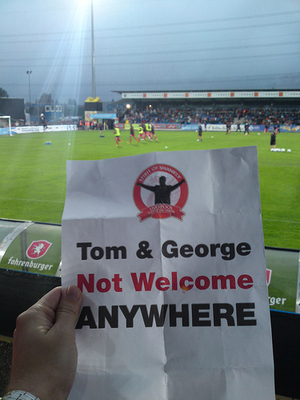 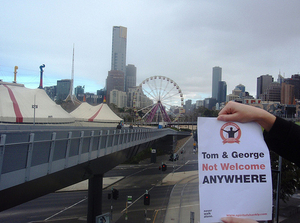 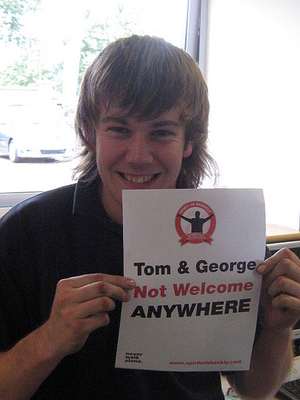 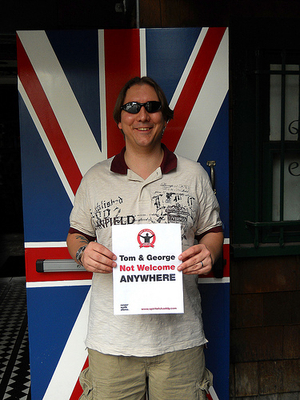 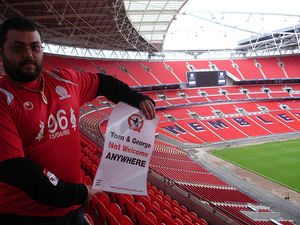 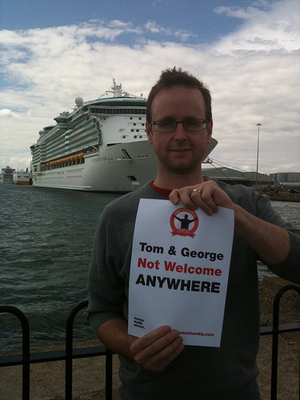 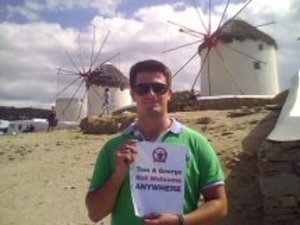 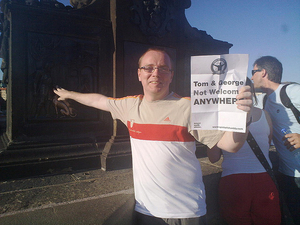 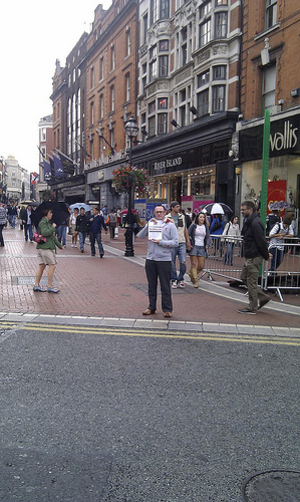 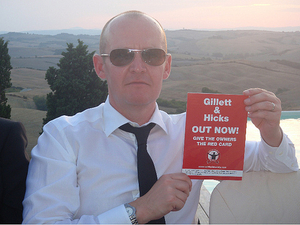 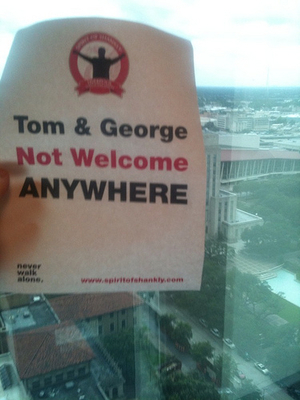 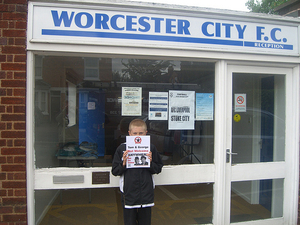 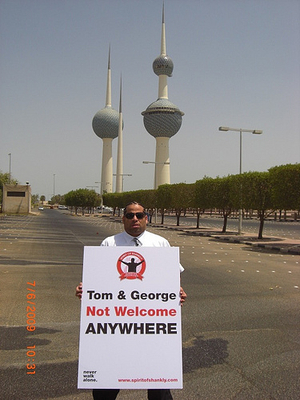 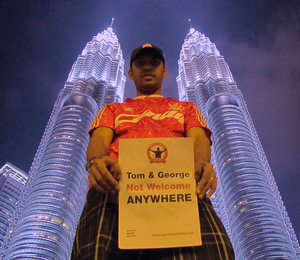 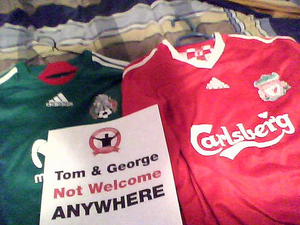 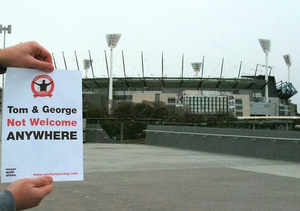 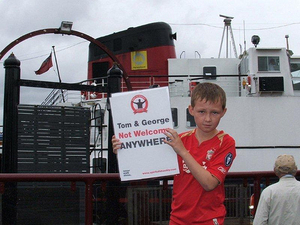 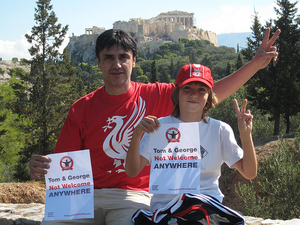 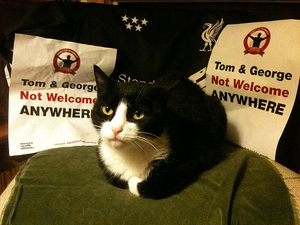 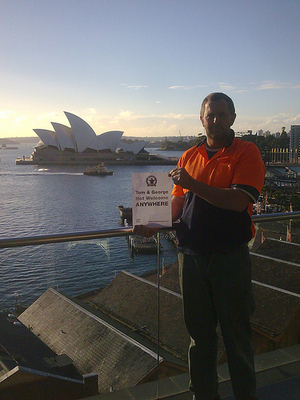 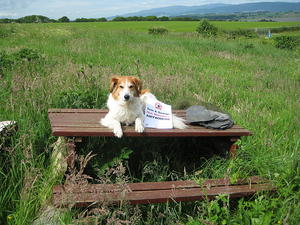 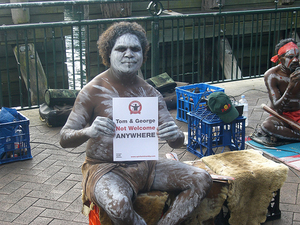 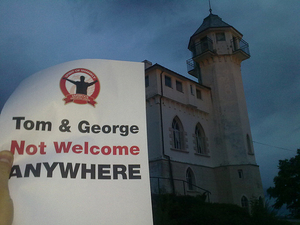 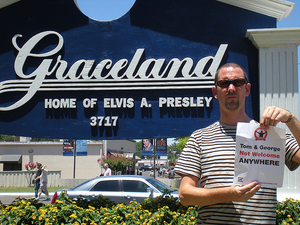 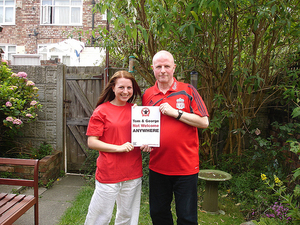 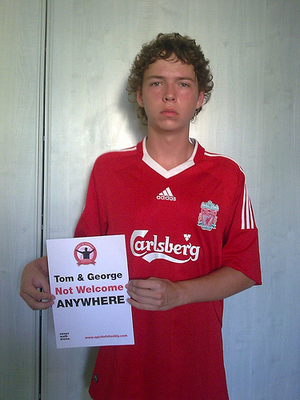 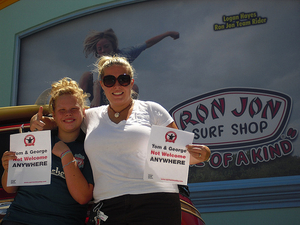 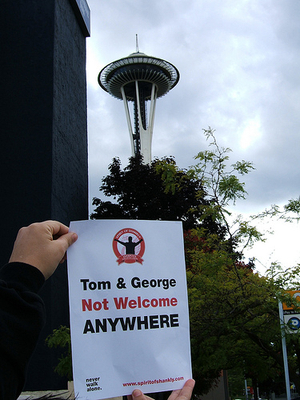 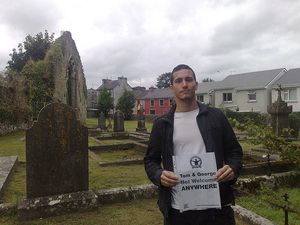 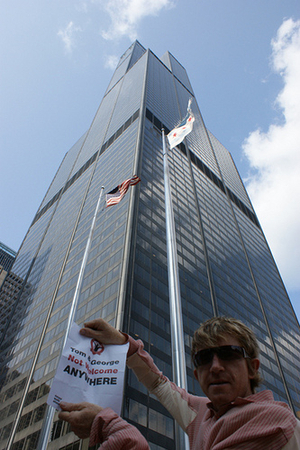 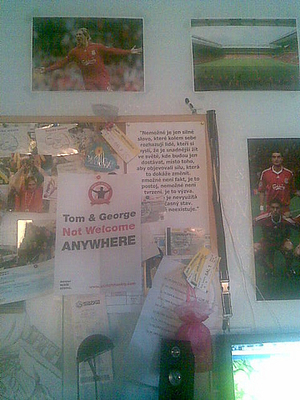 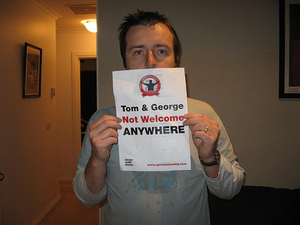 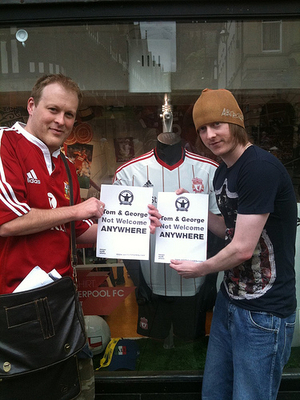 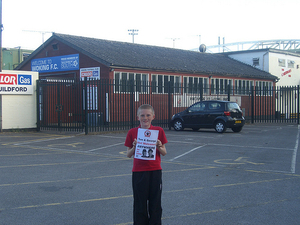 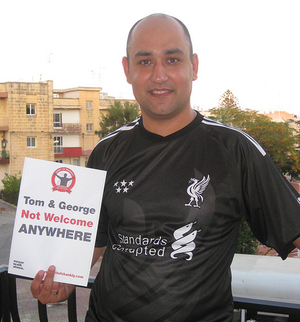 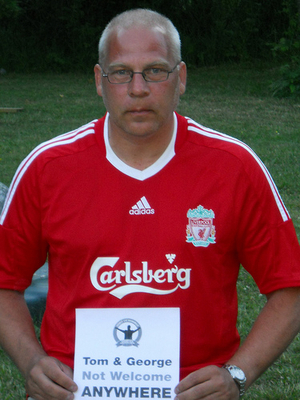 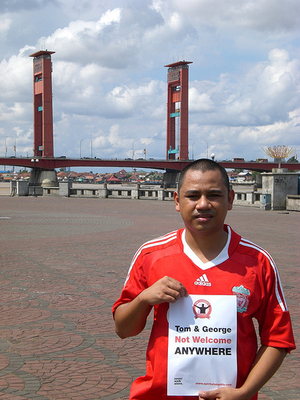 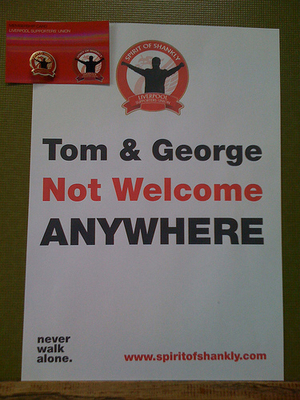 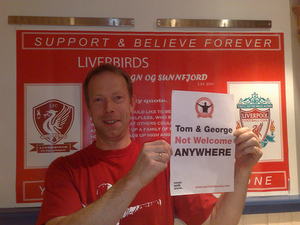 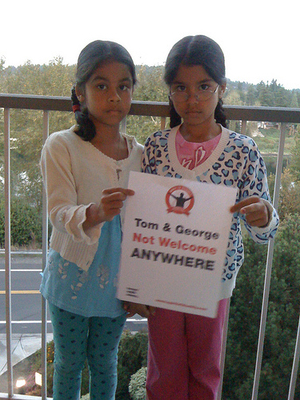 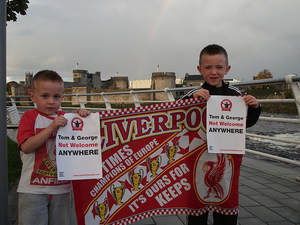 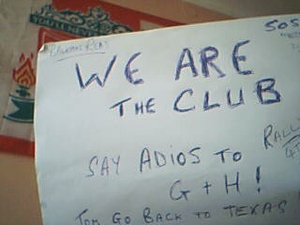 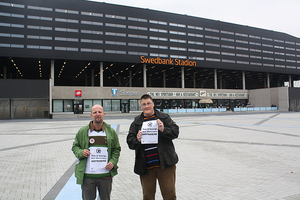 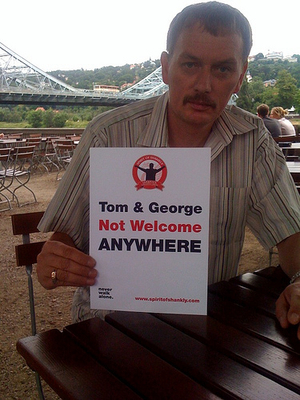 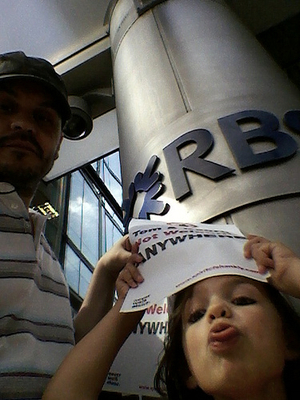 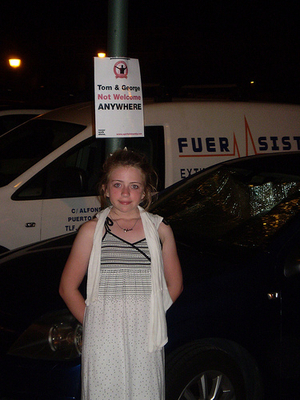 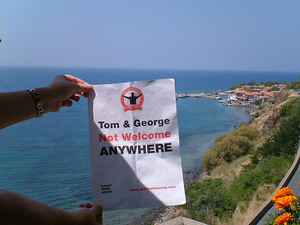 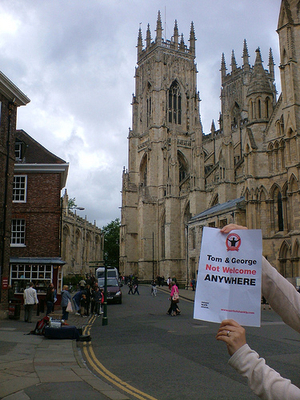 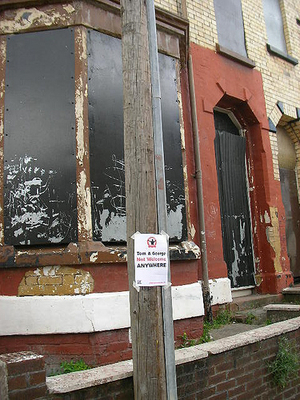 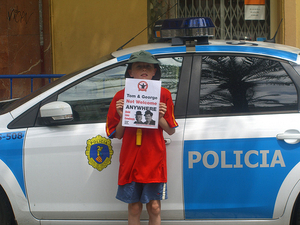 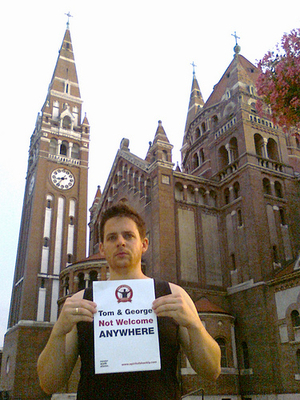 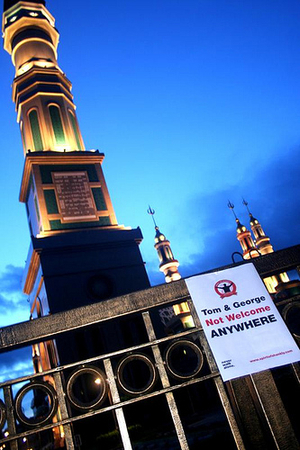 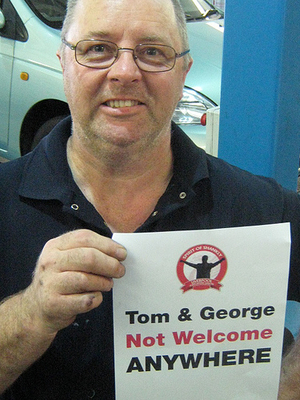 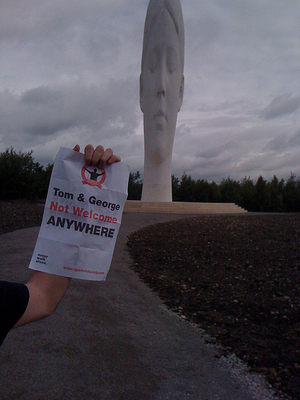 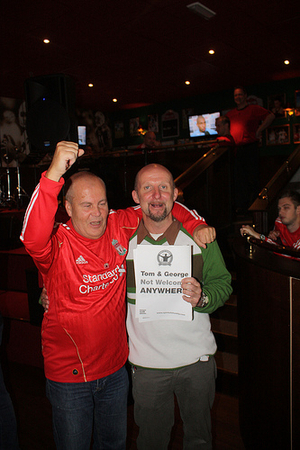 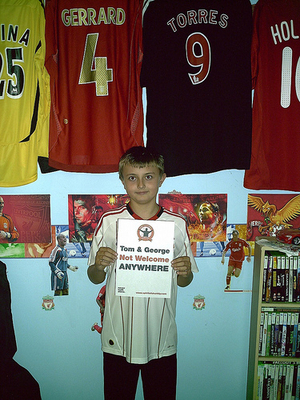 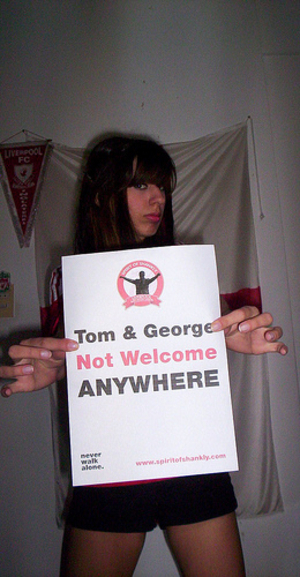 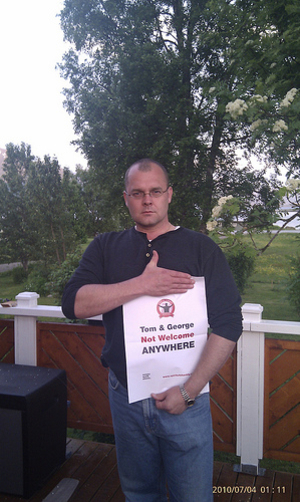 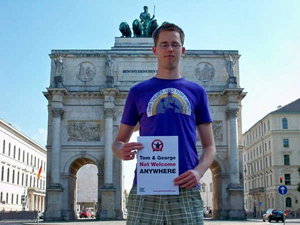 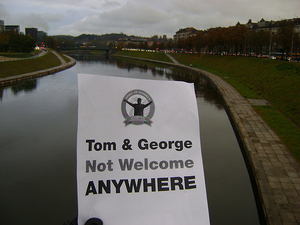 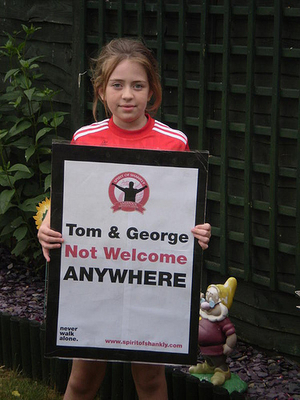 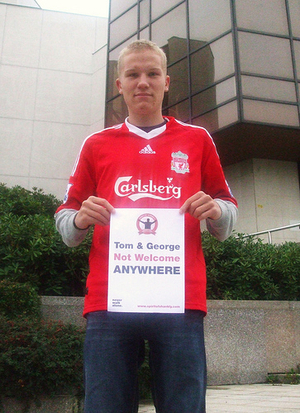 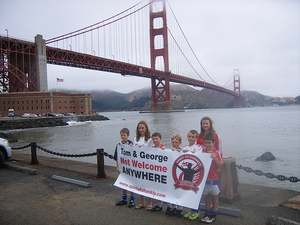 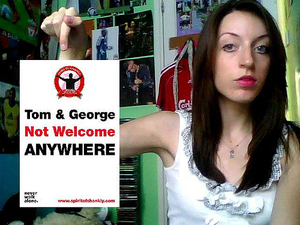 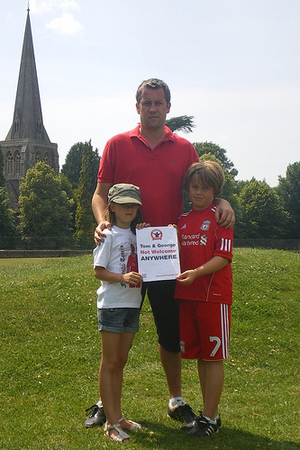 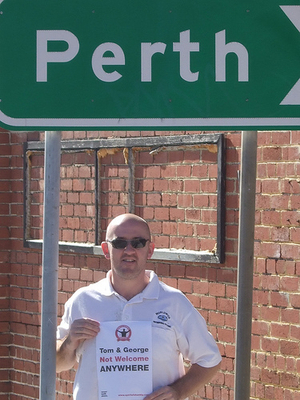 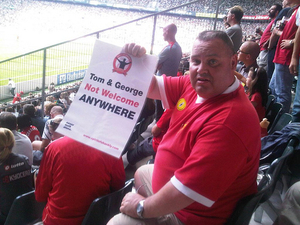 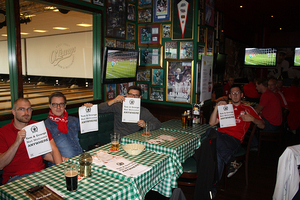 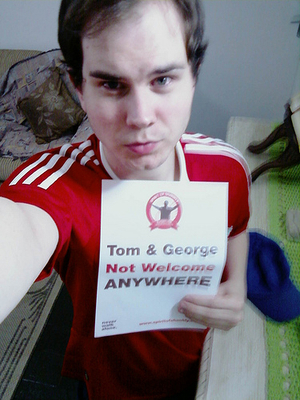 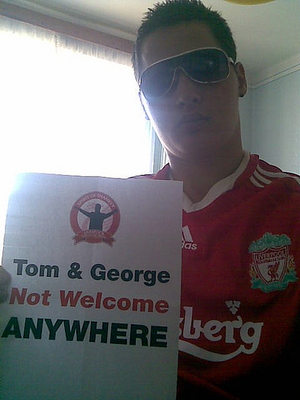 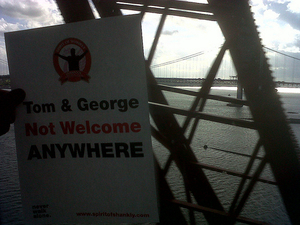 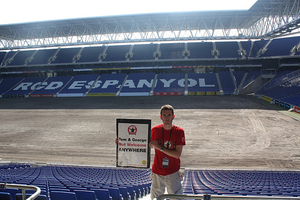 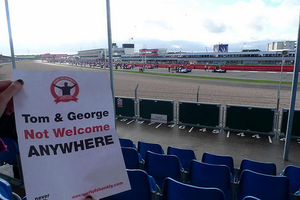 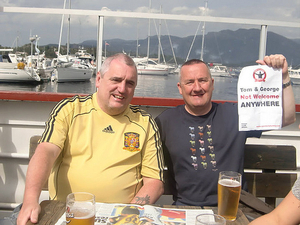 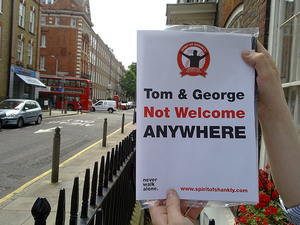 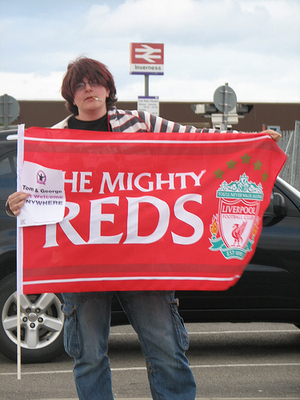 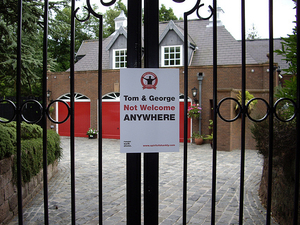 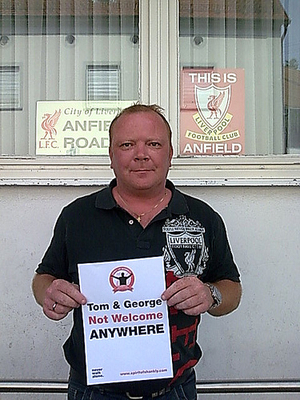 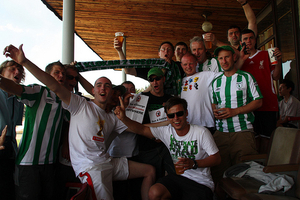 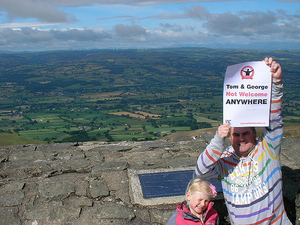 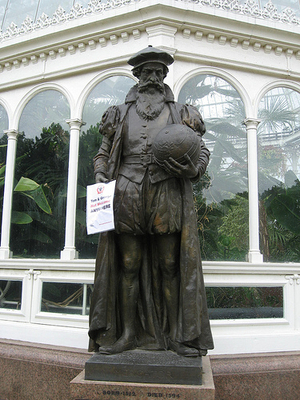 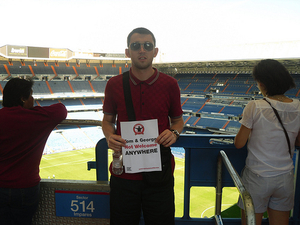 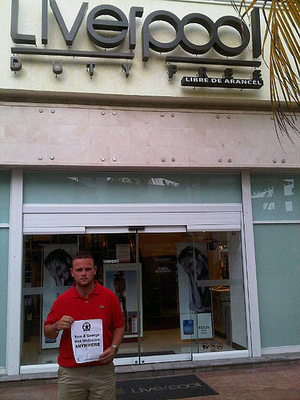 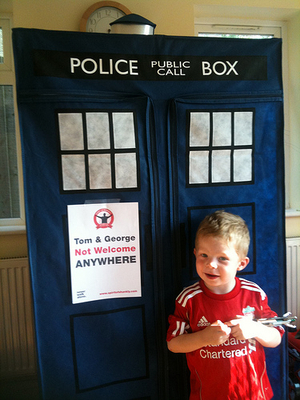 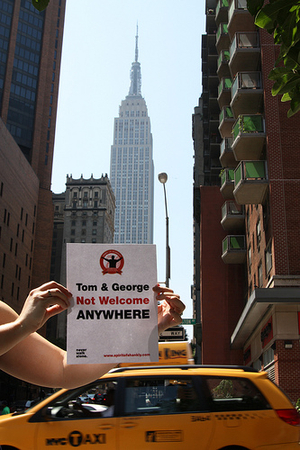 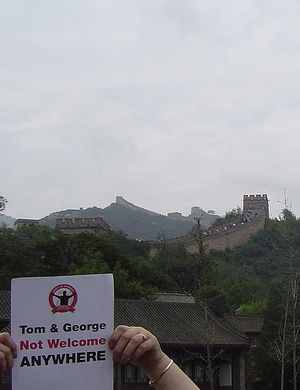 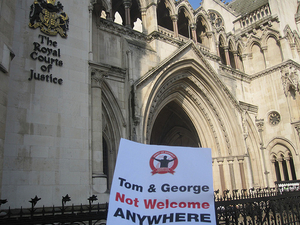 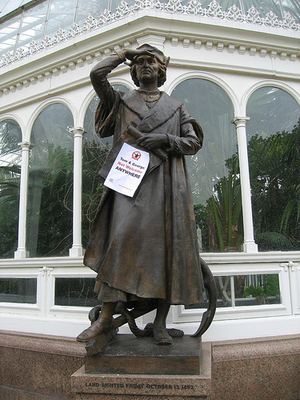 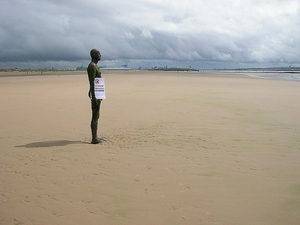 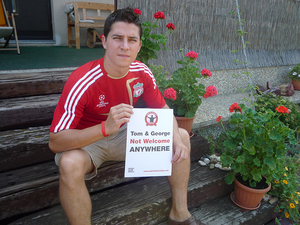 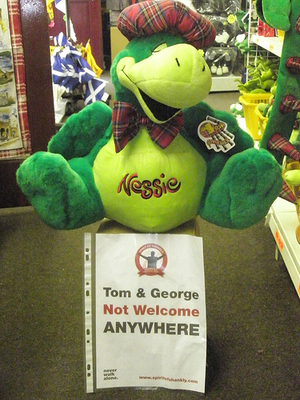 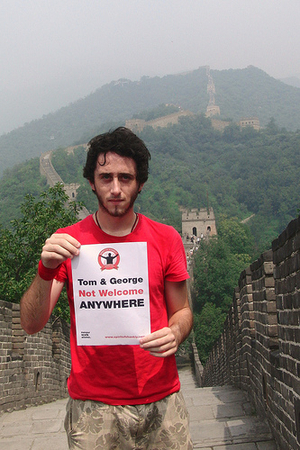 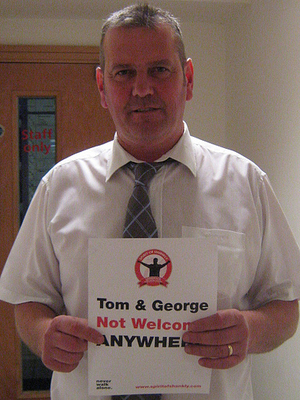 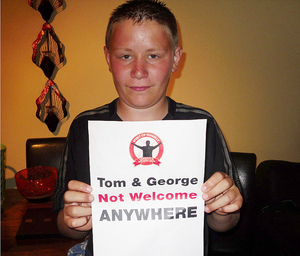 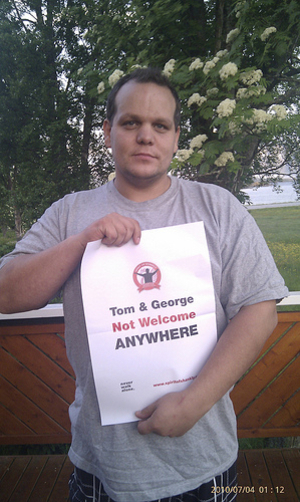 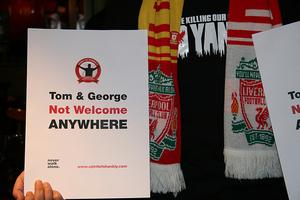 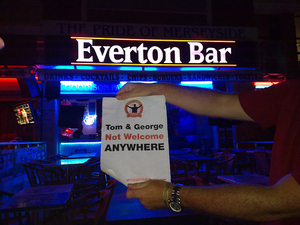 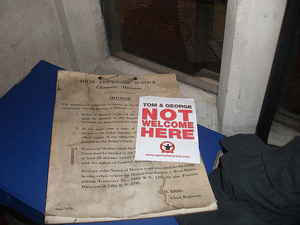 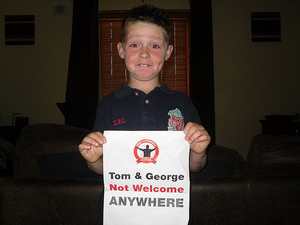 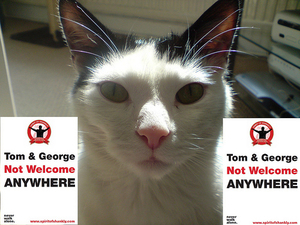 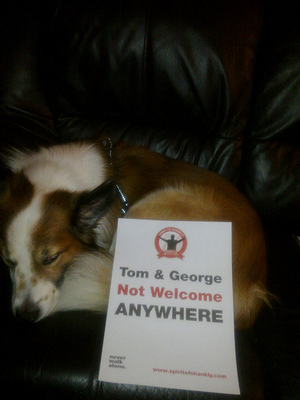 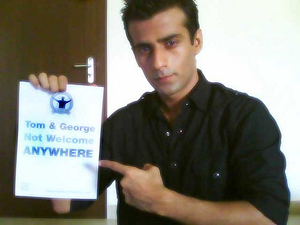 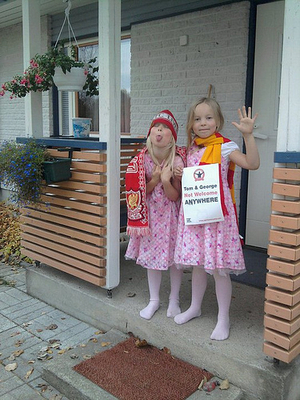 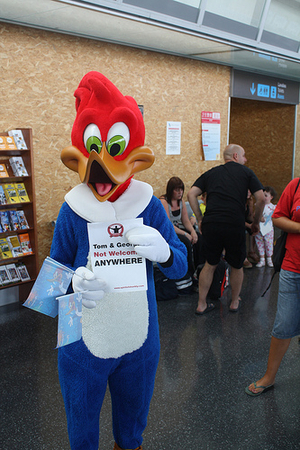 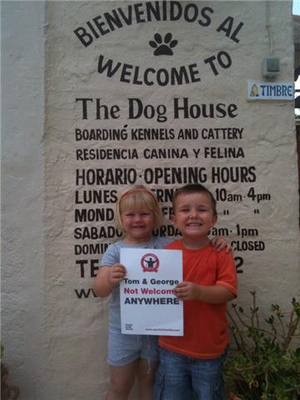 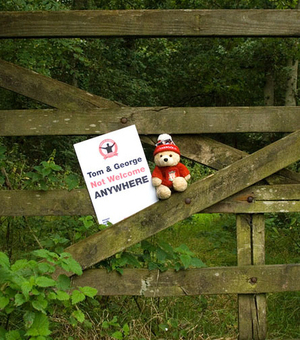 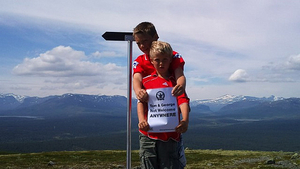 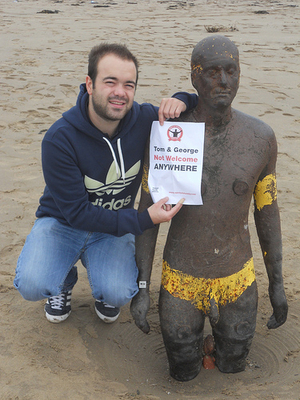 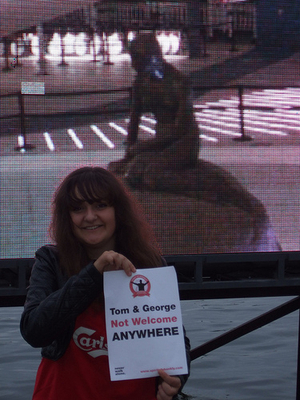 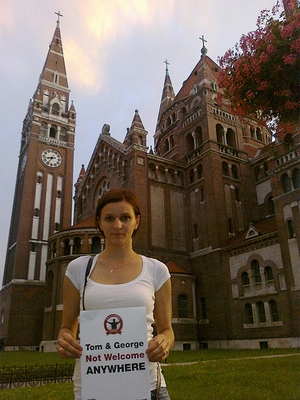 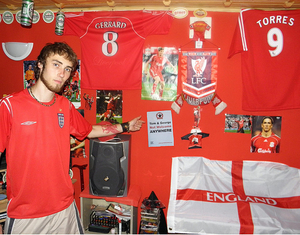 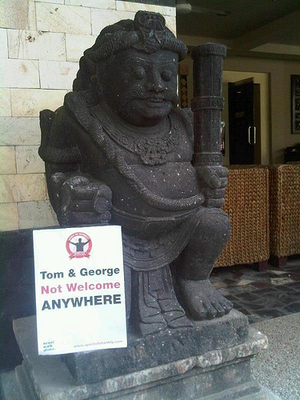 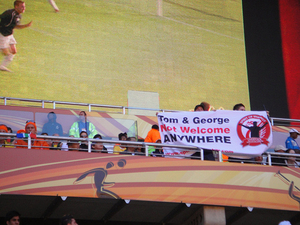 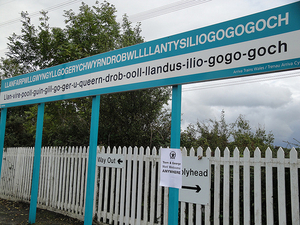 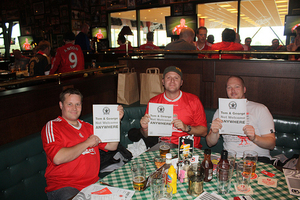 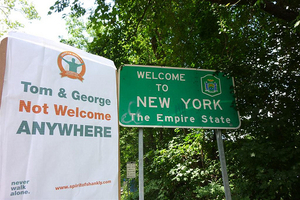 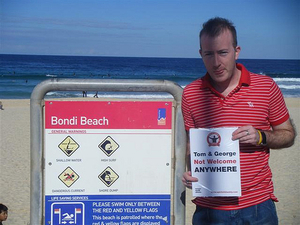 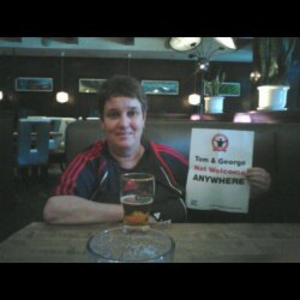 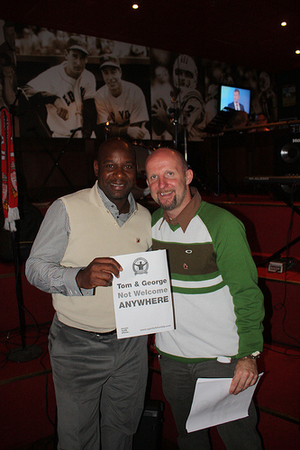 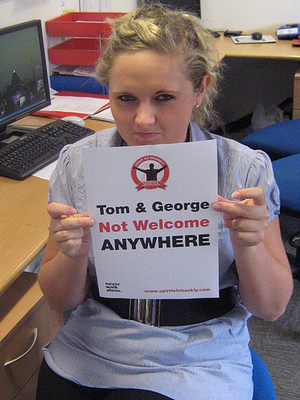 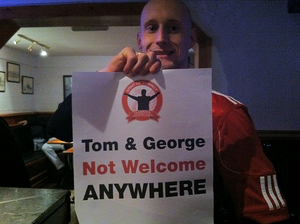 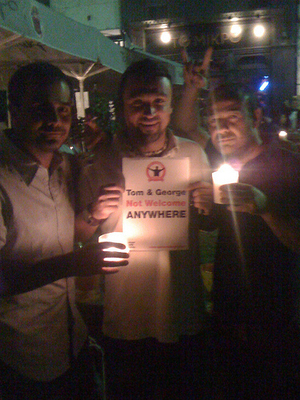 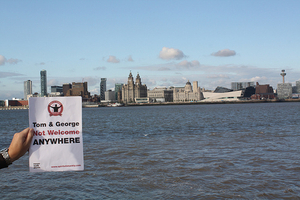 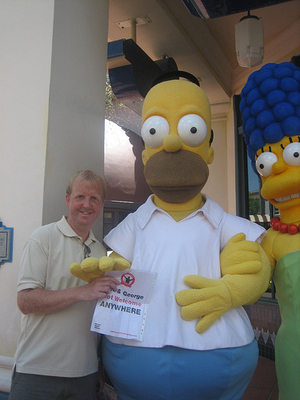 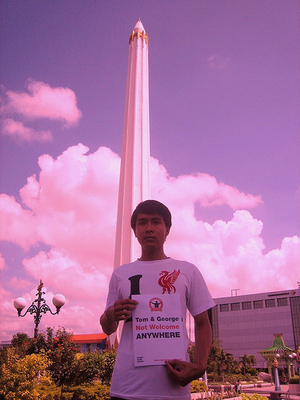 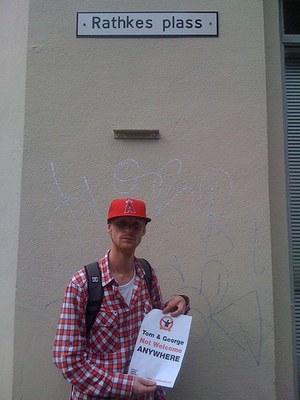 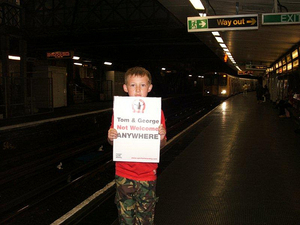 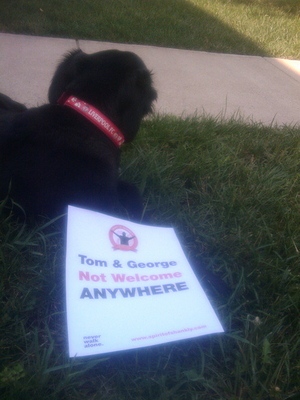 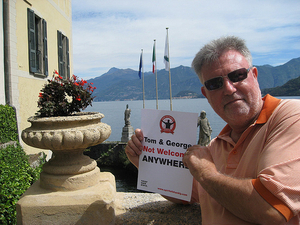 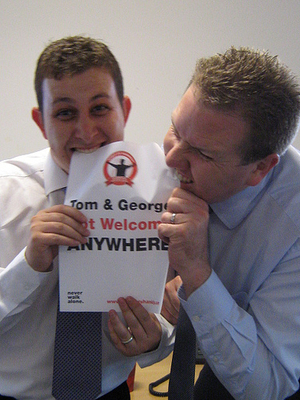 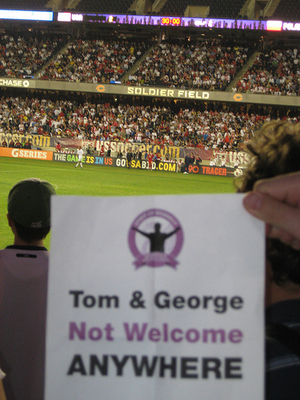 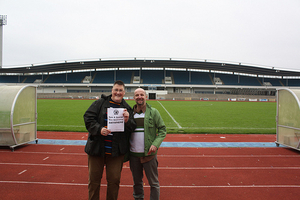 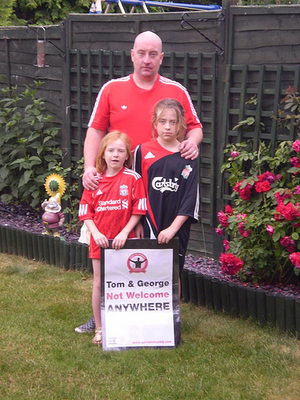 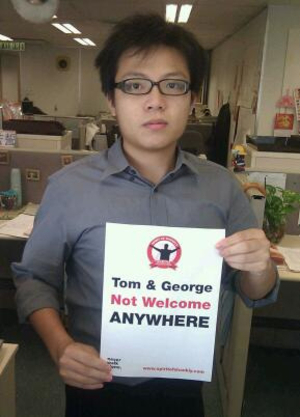 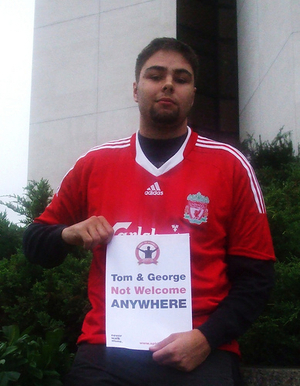 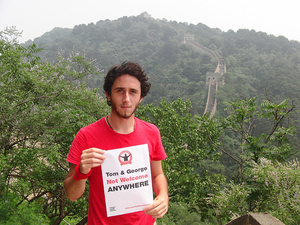 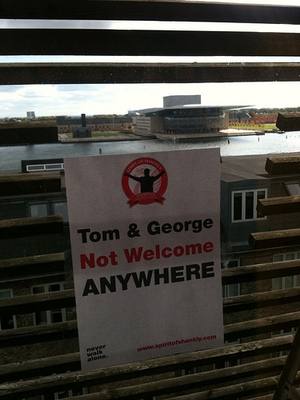 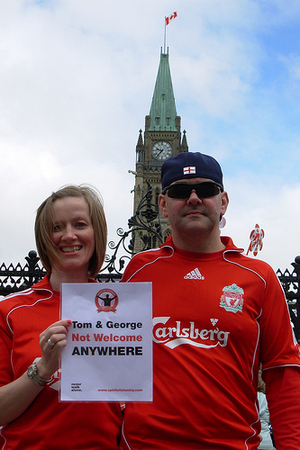 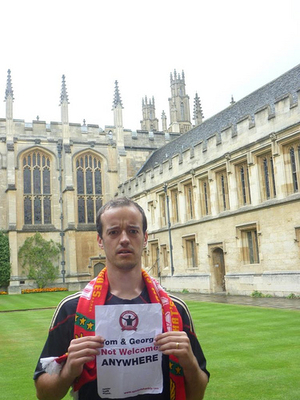 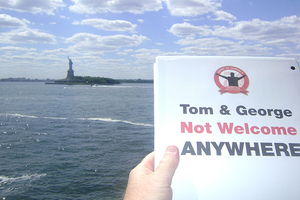 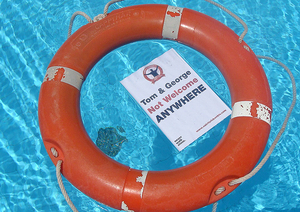 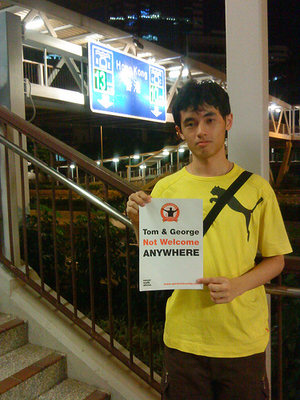 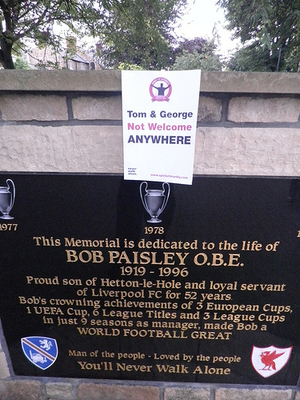 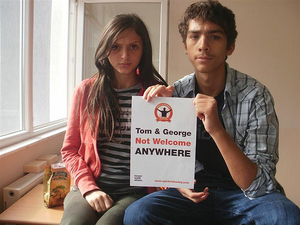 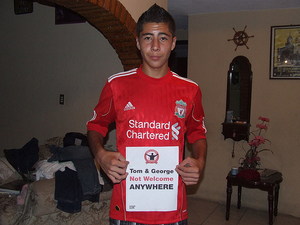 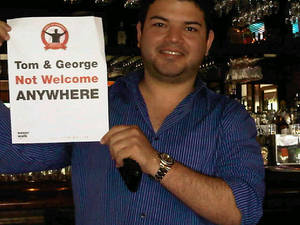 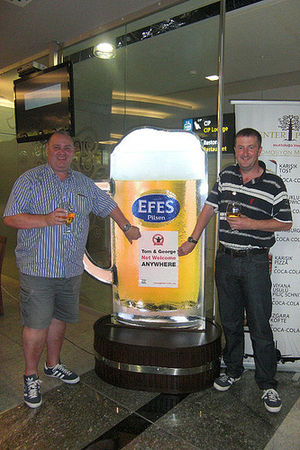 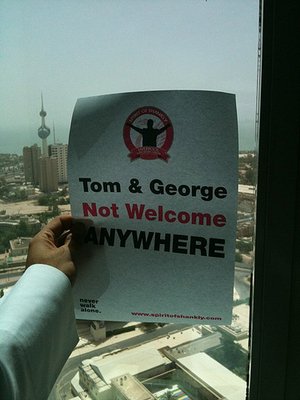 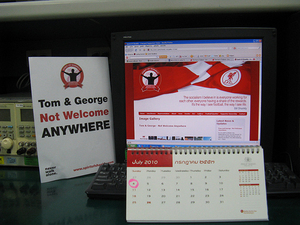 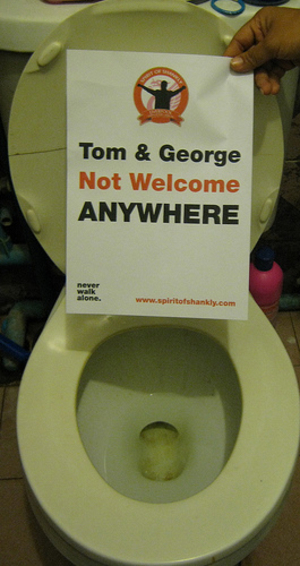 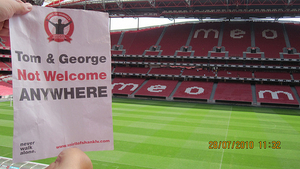 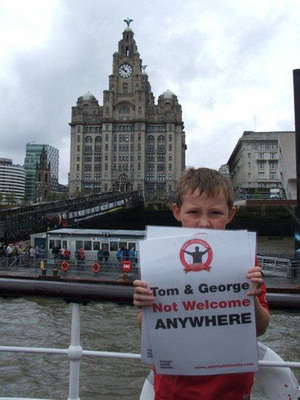 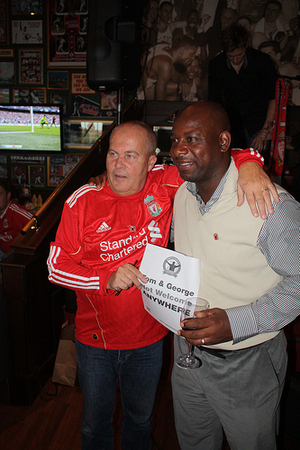 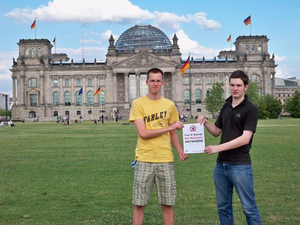 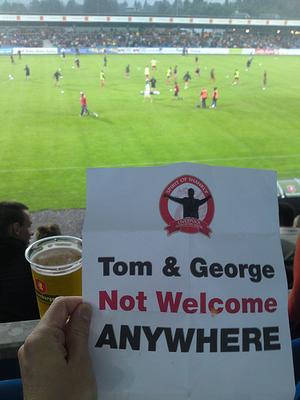 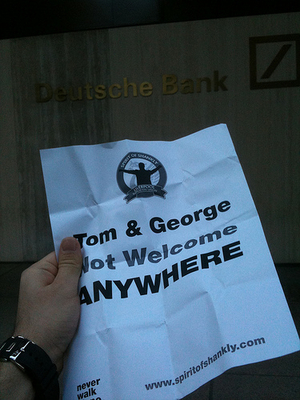 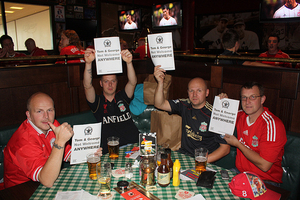 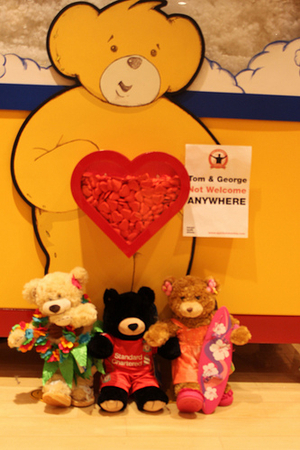 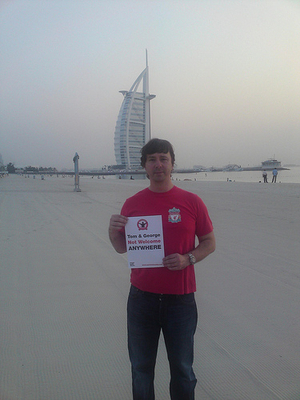 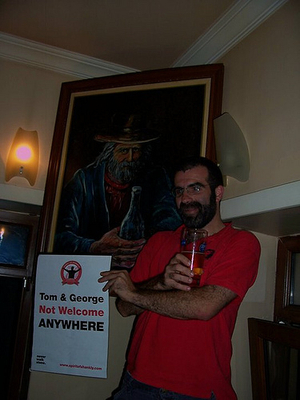 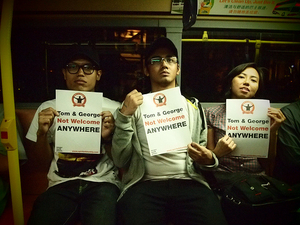 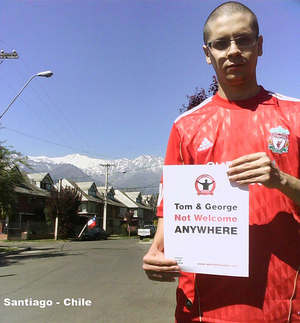 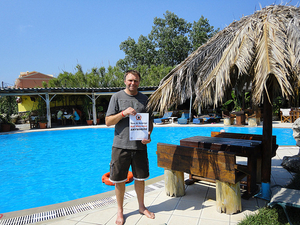 In the Summer of 2010 thousands of supporters took part in the 'Tom & George - Not Welcome Anywhere' campaign. 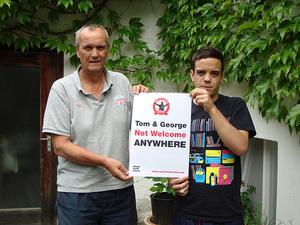 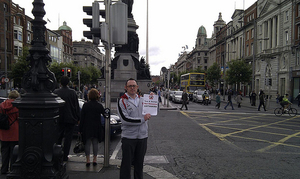 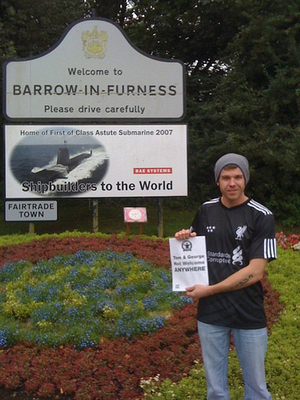 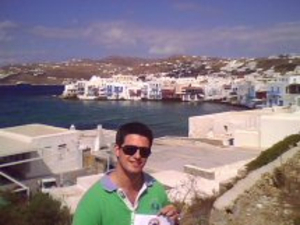 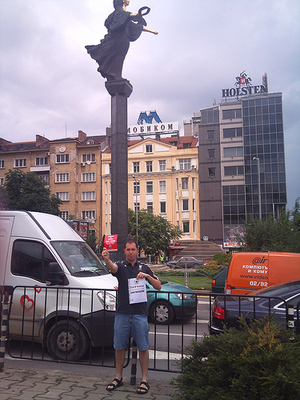 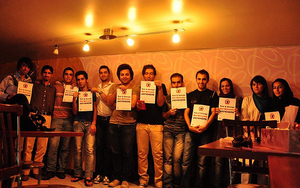 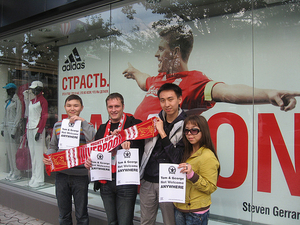 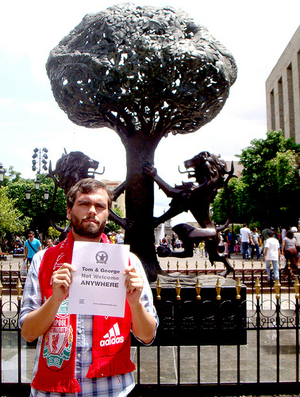 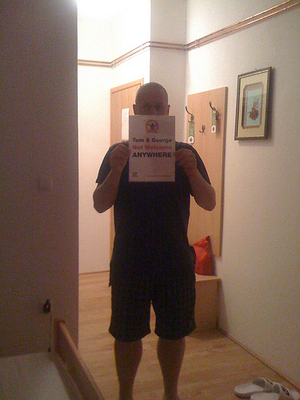 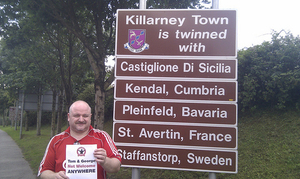 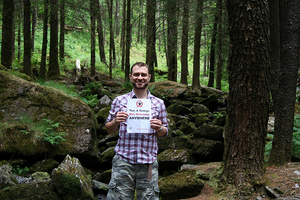 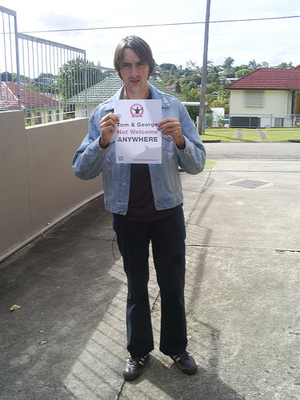 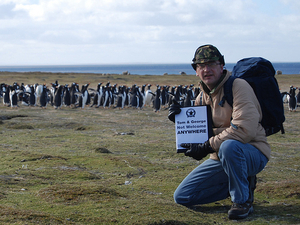 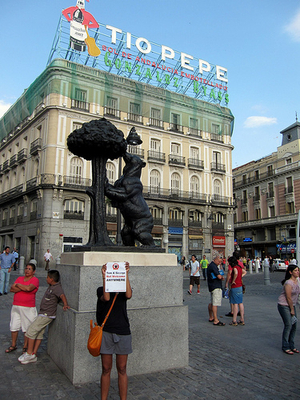 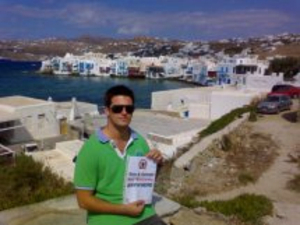 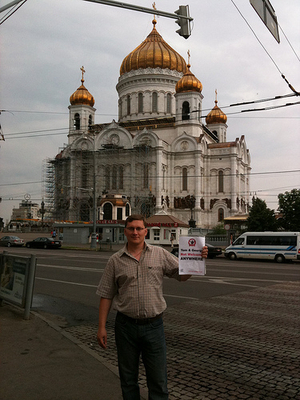 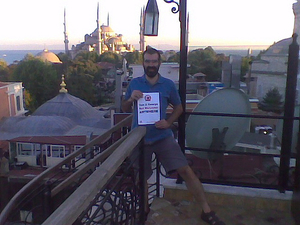 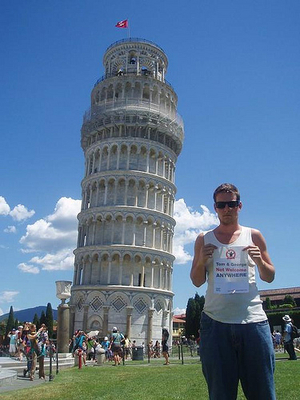 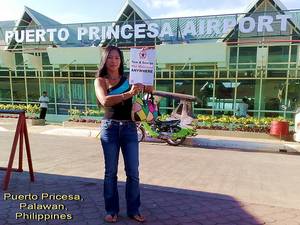 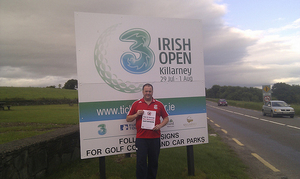 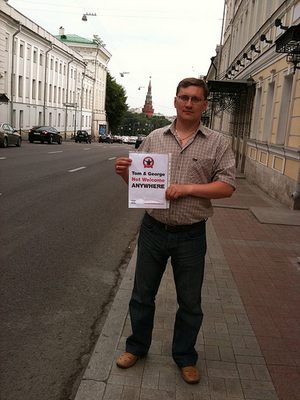 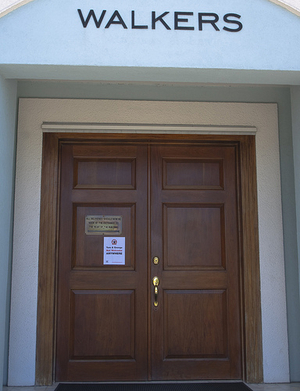 The main part of this campaign involved supporters taking a picture with a 'Not Welcome Anywhere' poster where they live or wherever they were on their travels. 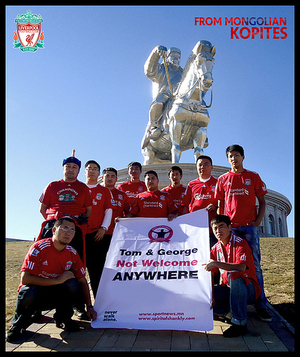 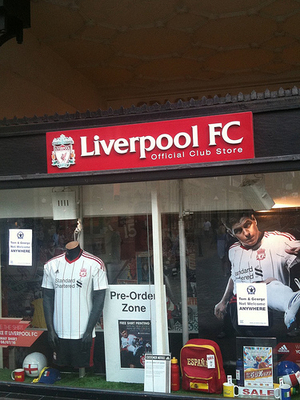 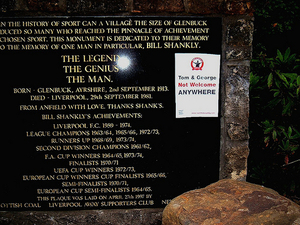 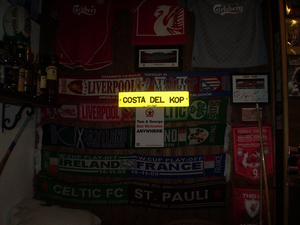 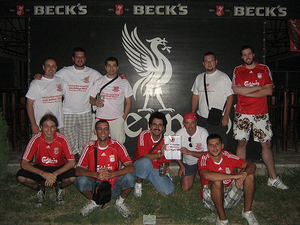 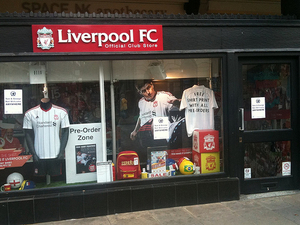 The pictures below show how far and wide this campaign reached and illustrates not only the global support of Liverpool FC, but also the humour and originality of the supporters. 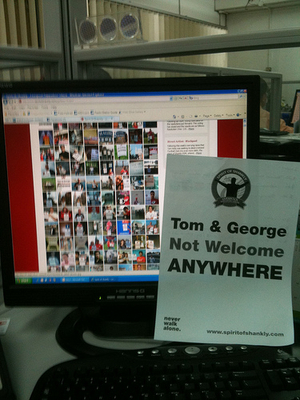 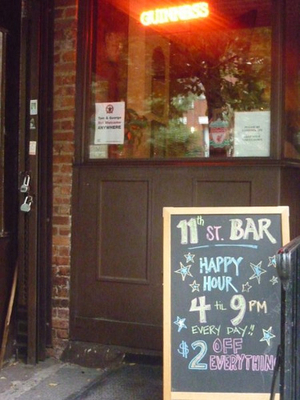 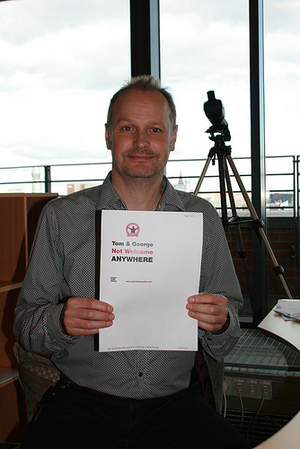 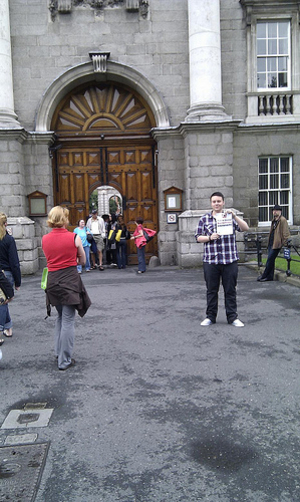 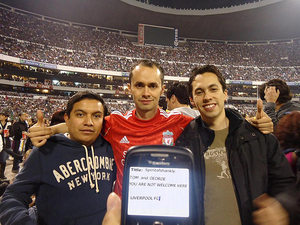 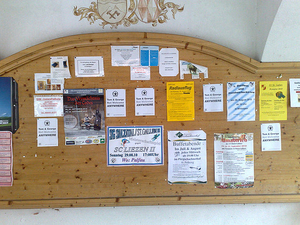 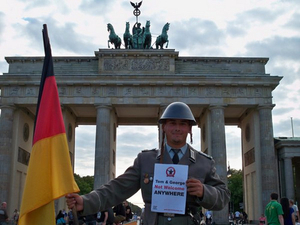 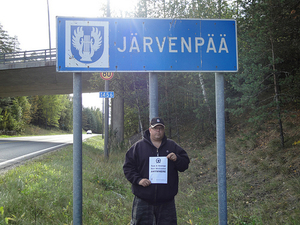 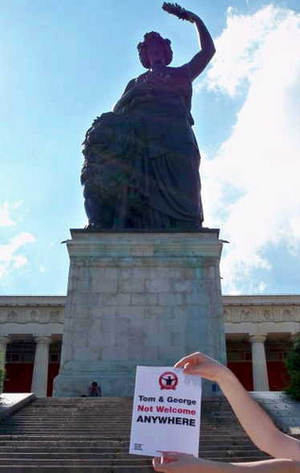 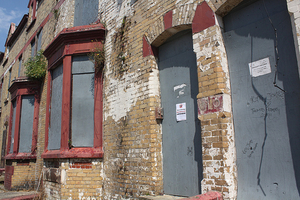 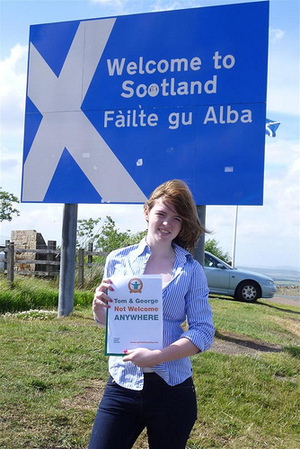 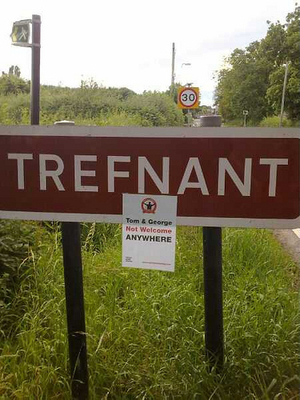 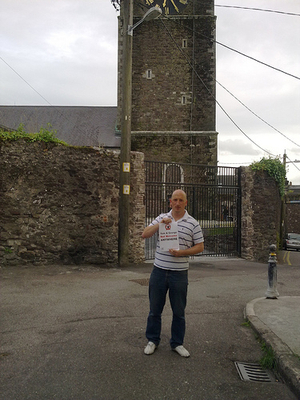 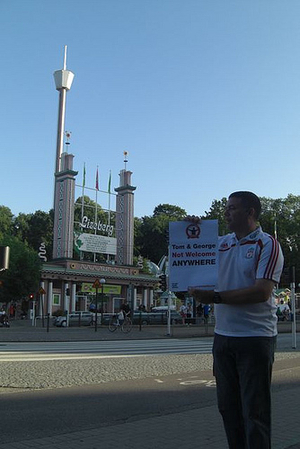 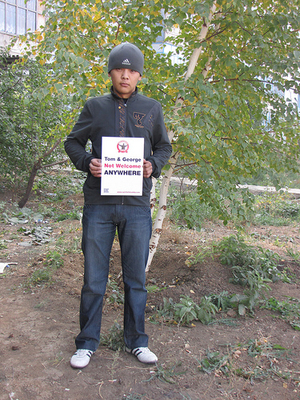 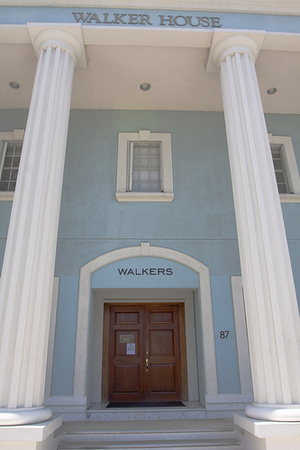 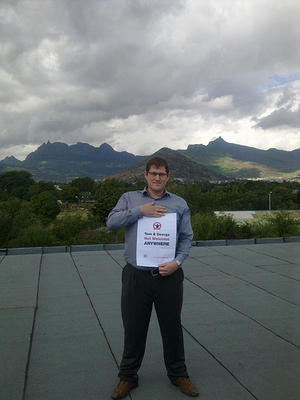 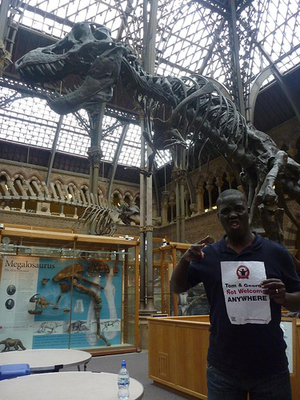 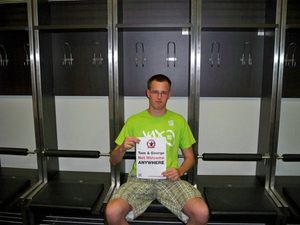 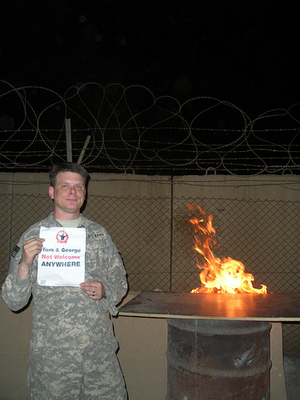 You can view a map of the locations of the 'Not Welcome Anywhere' pictures here. 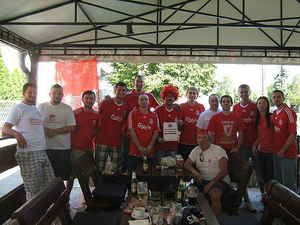 Can you find yourself in the pictures?